The ancient civilisation of Angkor has fascinated many people, but until the late 19th century, it remained largely unknown to the outside world. 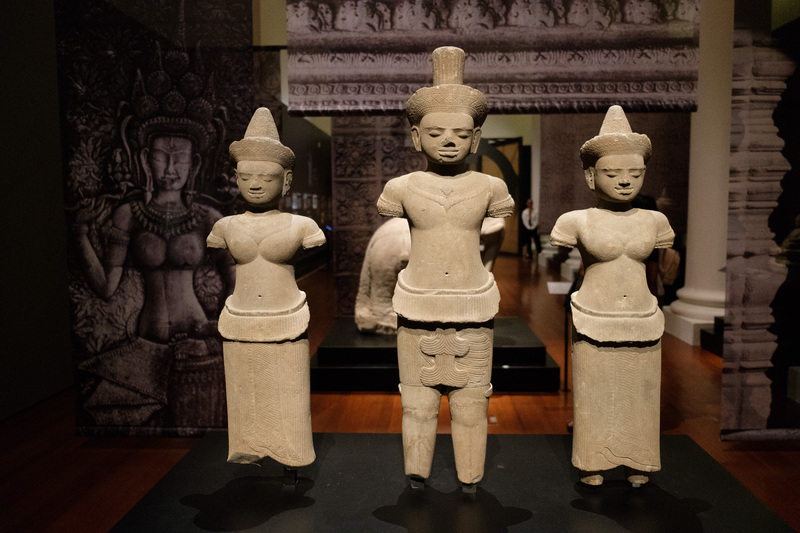 In collaboration with the Guimet Museum in Paris, the Asian Civilisations Museum (ACM) of Singapore presents a new exhibition titled “Angkor: Exploring Cambodia’s Sacred City”. The exhibition features rare Khmer sculptures, French drawings, photographs and memorabilia that tell the story of the French encounter with Angkor and its sensational emergence onto the international stage. I was invited to view the exhibition by Ms Trudy Tan, PR and Events Manager from ACM and it was quite an eye opener. 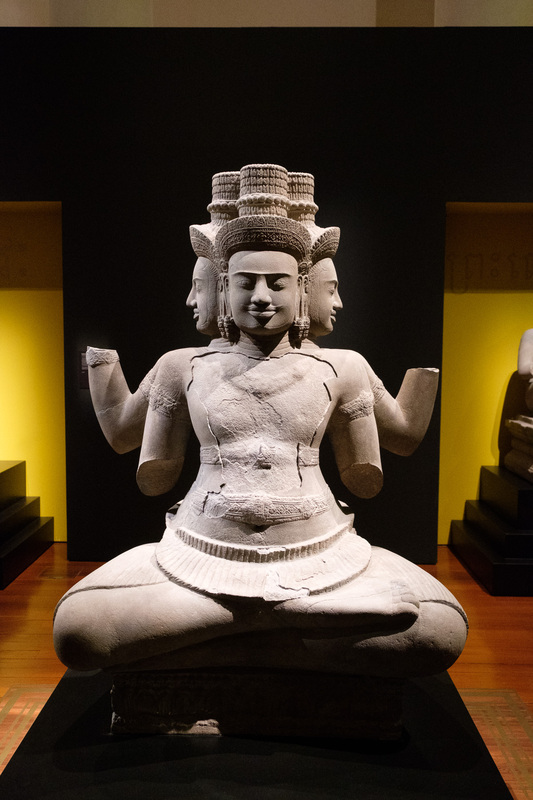 At the Angkor-themed gallery, visitors are greeted by a serene statue of Bodhisattva Avalokitsehvara from the 7th or 8th century. 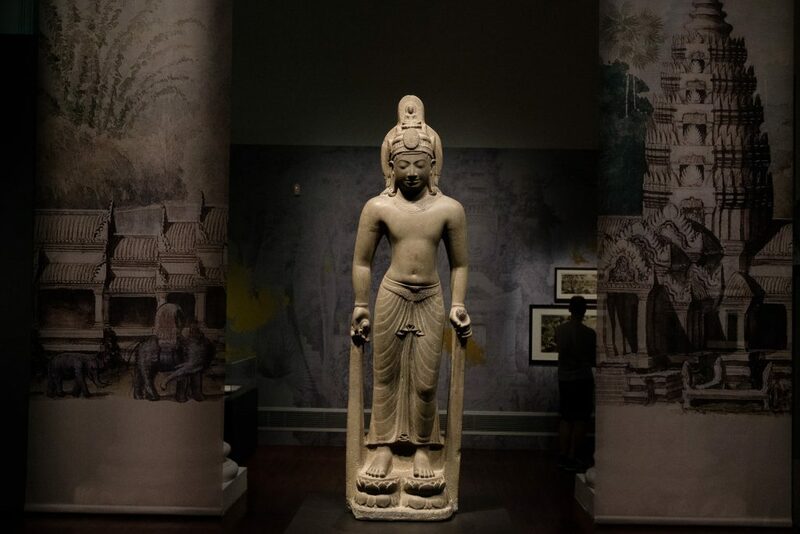 A statue of Bodhisattva Avalokiteshvara from mid 7th or 8th century greets visitors to the exhibition. This section of the exhibition prominently features drawings of Angkor by French explorer and artist, Louis Delaporte. 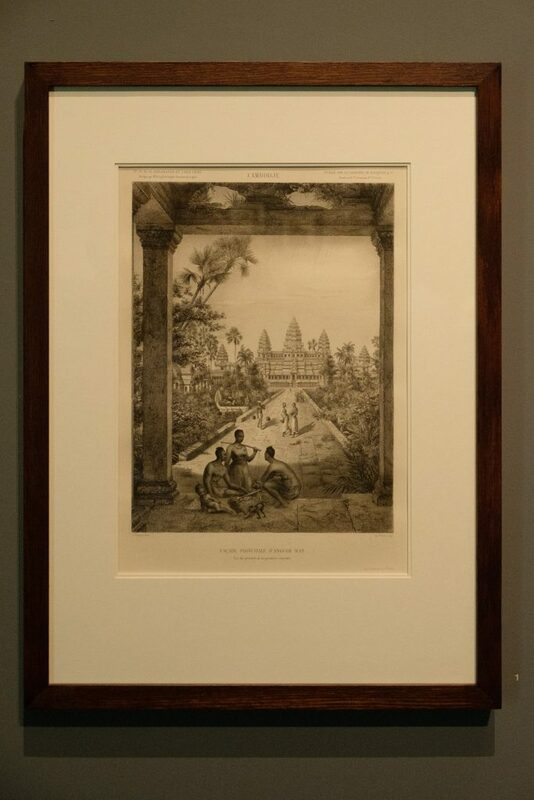 Delaporte has also exercised his artistic license in several of his drawings, lending his own interpretation of the surroundings of the ancient civilisation. 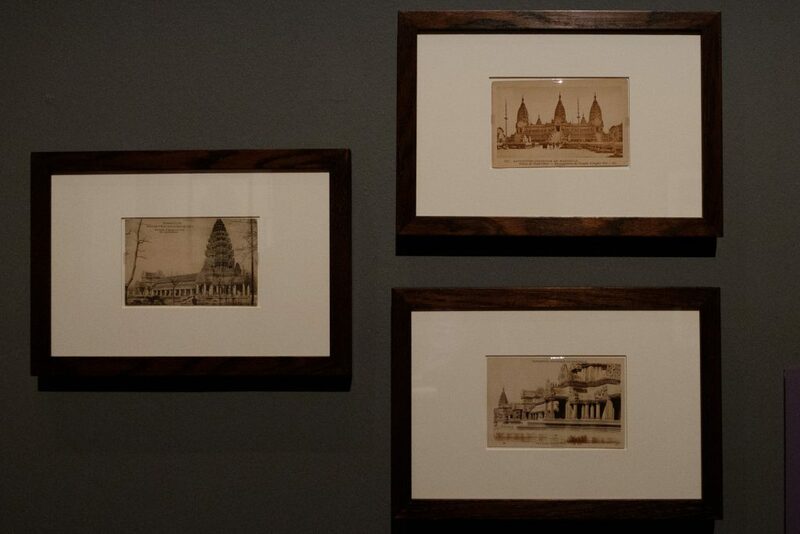 Delaporte’s drawings are mostly done with pen, pencil and watercolour and are incredibly detailed. Here is a close-up shot of the above drawing showing the intricate details. 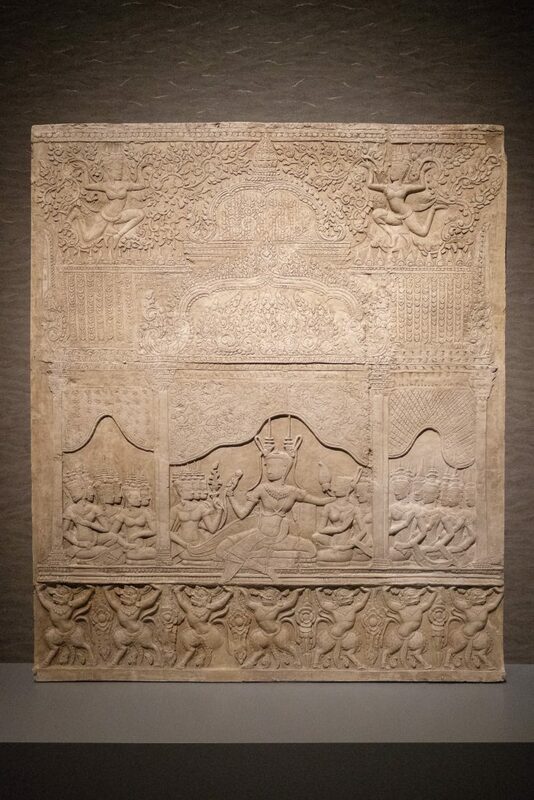 The next section of the exhibition features rubbings and plaster casts made from the wall carvings of the ancient temples. 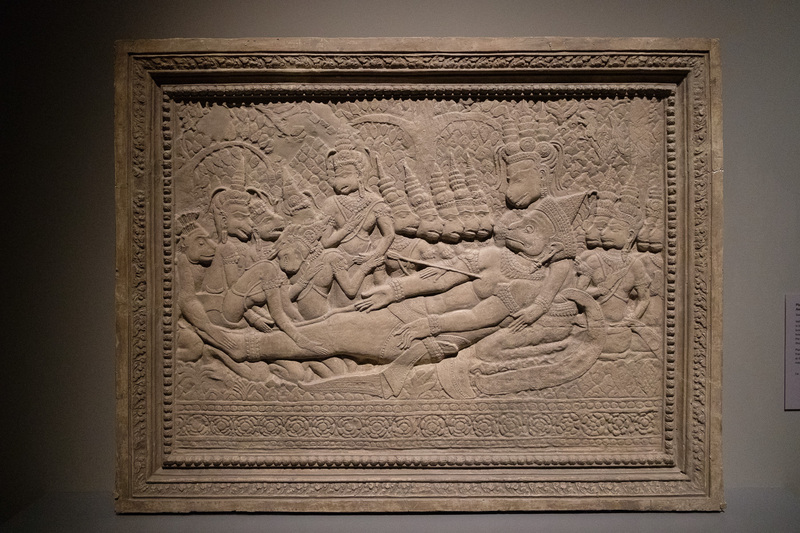 In some instances, these plaster casts are the only remaining record of the original structure, such as this one titled “Heavens and Hells”. 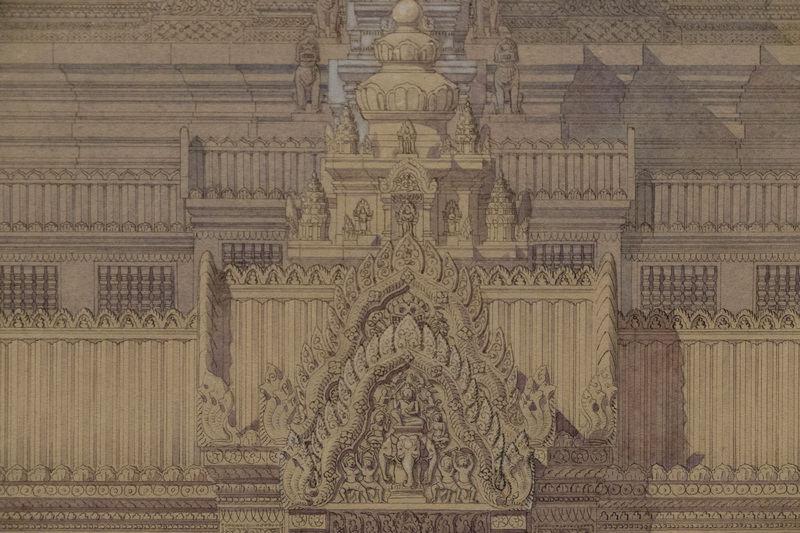 The original has been destroyed in a collapse in 1947. 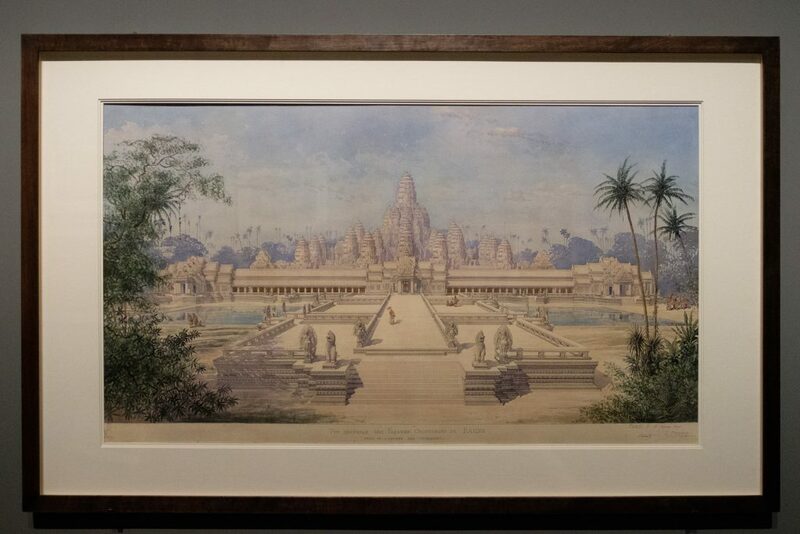 Next, we have a section showing Angkor being featured in expositions such as the Universal Exposition in Paris, 1878 and the Colonial Exposition in Marseille in 1906. 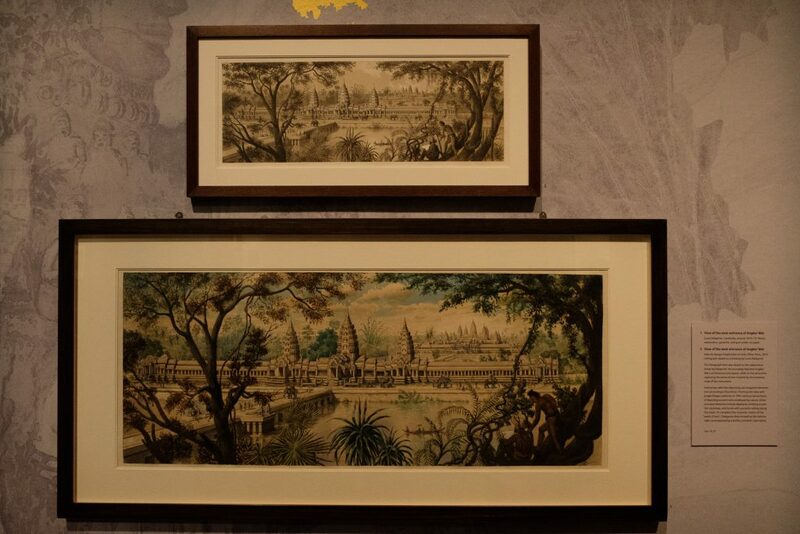 Various postcards from the Colonial Exposition depicting images of Angkor. 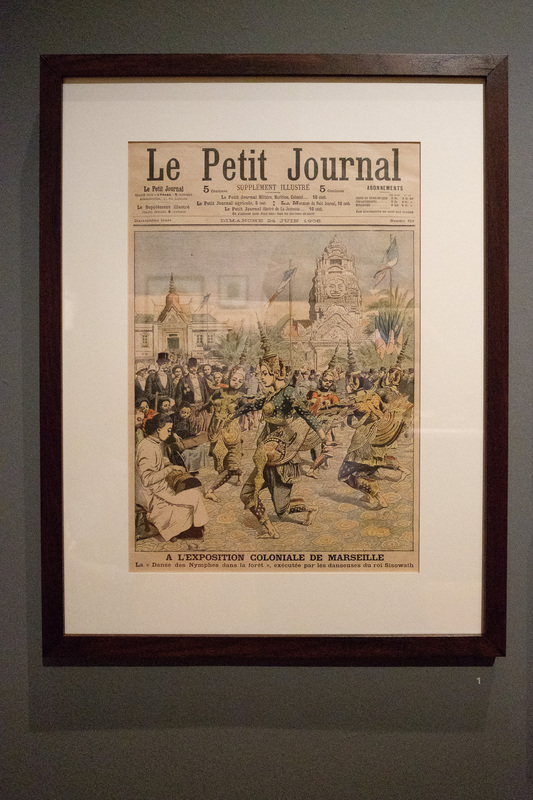 The cover of Le Petite Journal, 1906, depicting the Marseille Colonial Exposition. 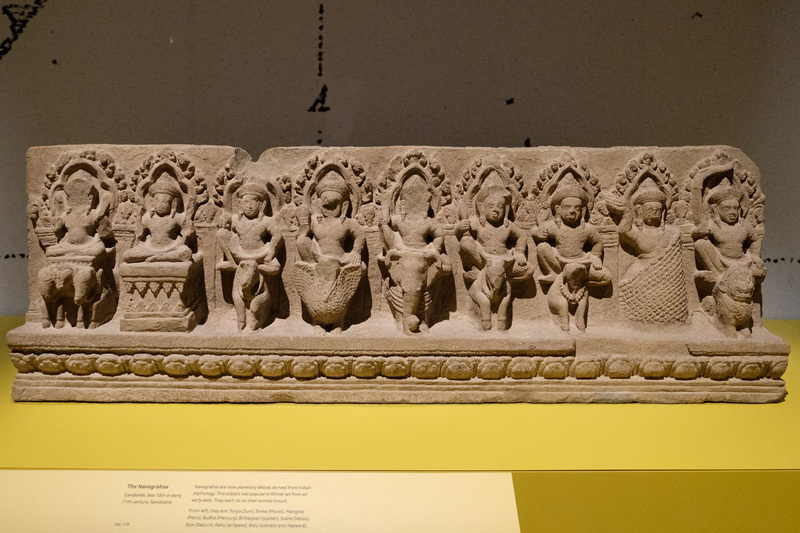 In the next section, we have various statues of gods and deities, as well as architectural such as lintels and pediments. 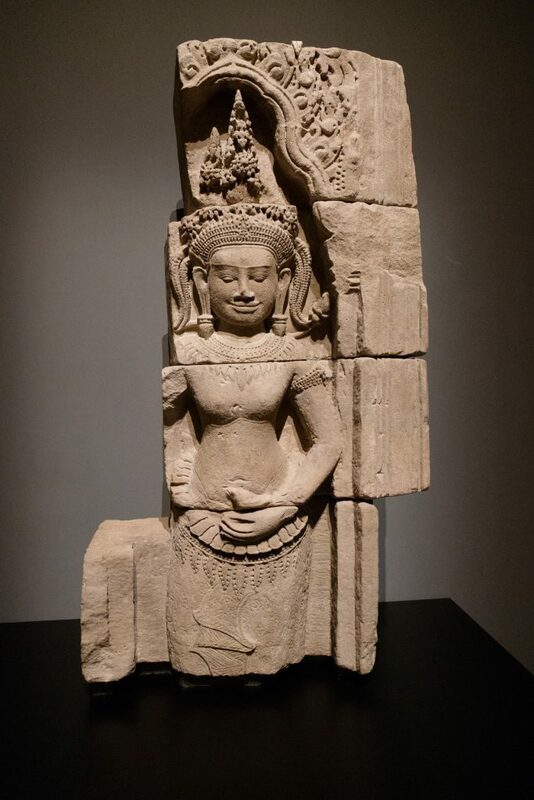 This statue of a female deity from the late 9th century is interesting, in that the head and body were separately discovered, and miraculously re-united in France in 2006. 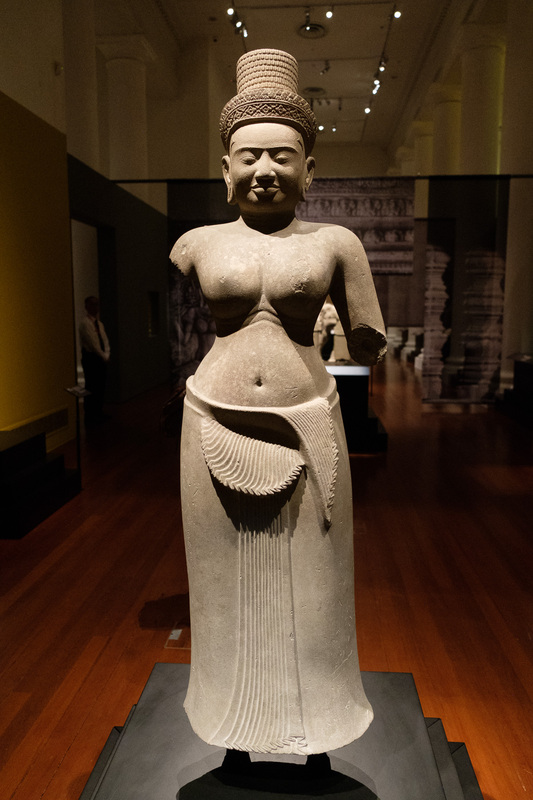 The statue is highly detailed, showing her coiled tresses and pleats of her dress. 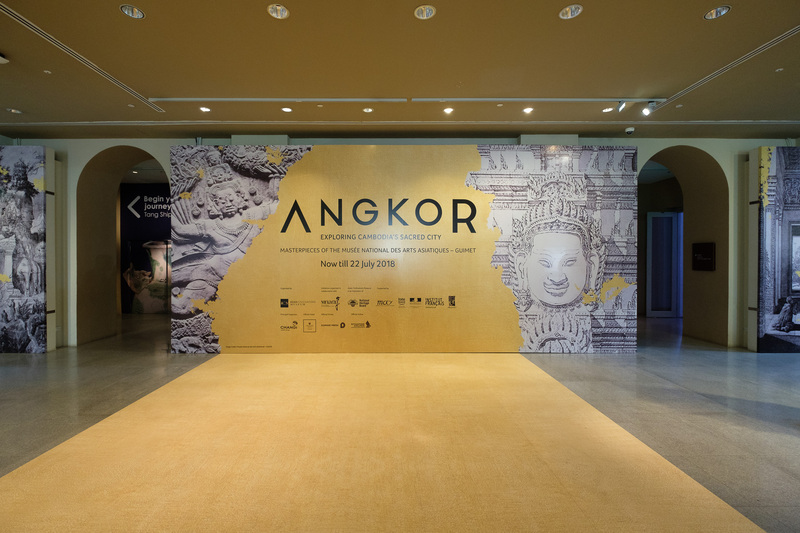 Angkor: Exploring Cambodia’s Sacred City will run from 8th April to 22 July 2018. Visit the ACM website for more details. 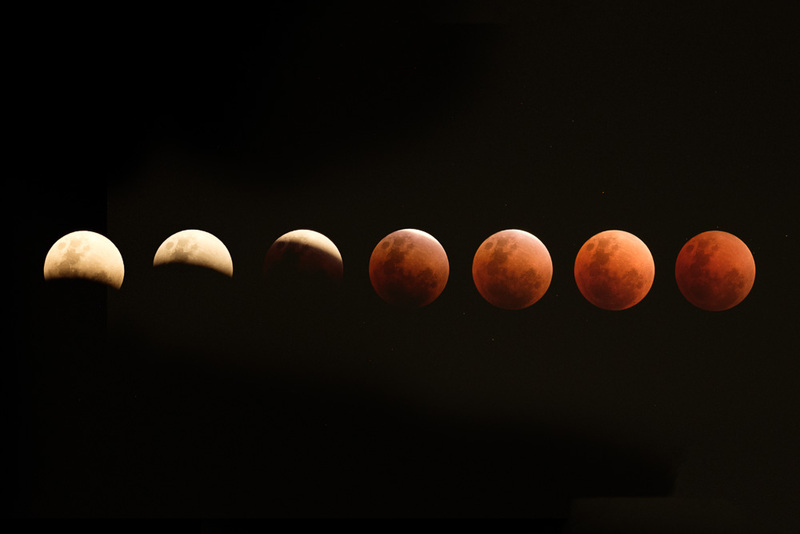 A composite of the moon phases as it goes through the total lunar eclipse on 31 Jan 2018. Each shot is spaced about 4 minutes apart. On 31 January of 2018, sky watchers were treated to a rare astronomical event—a trifecta of a supermoon, blue moon as well as a blood moon. The last time this occurred was over 150 years ago, in 1866. A supermoon occurs when the moon is at the closest point to earth in its orbit, making the moon appear slightly larger than normal. Blood moon, on the other hand, refers to the phenomenon which the moon takes on a reddish tinge during total eclipse, when the moon is in the earth’s shadow. Contrary to the name, the term blue moon does not refer to the colour blue, but the second full moon within the same month. This does not happen that frequently, hence the phrase, “Once in a blue moon”. 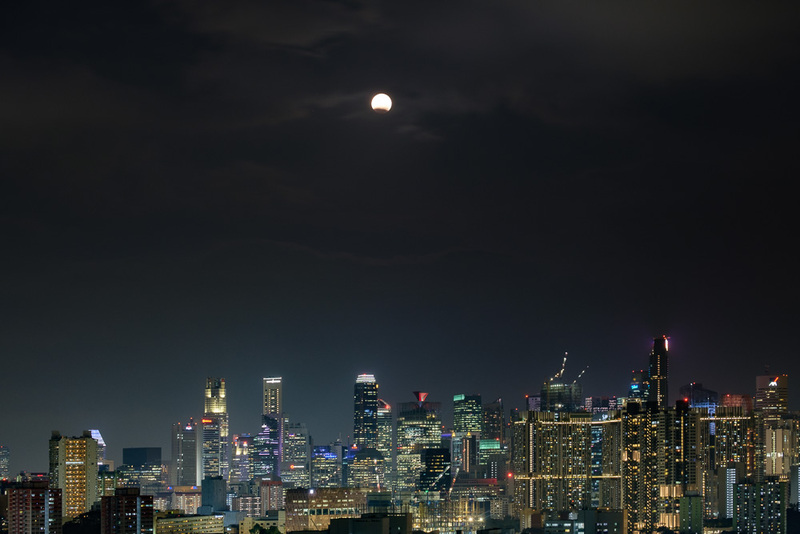 I had shot a previous supermoon with the Marina Bay Sands skypark in the background, this is the first time I’m experience a total lunar eclipse at the same time. I almost did not get to witness and shoot this, as a large thunderstorm rolled in a few hours before sunset. 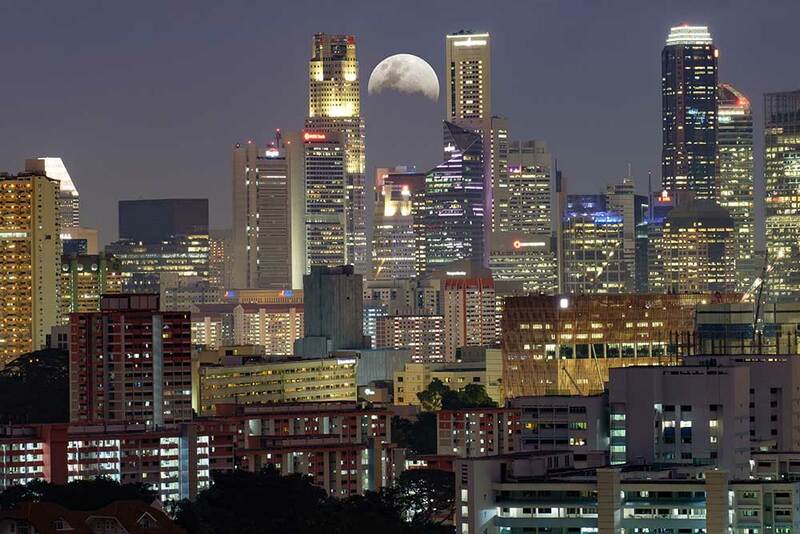 In fact, it appears that every time a great astronomical event happens, Singapore would be rainy or cloudy. Thankfully, the storm cleared up in time for celestial show. There was even a sunset! Having seen a photo on Instagram of the view from Mt. Faber with HDB flats in the foreground and the city skyline in the background, I had envisioned a shot with the moon rising behind the city skyline, so I decided to shoot from Mt. Faber for this event. The rain has cleared by the time I reached my viewpoint, and there was even a sunset, so chances are good that we will see the eclipse. A few photographers were already there, setting up their gear. I setup two cameras—a Fujifilm X-T2 with the XC 50-230mm for close-ups of the moon, and a Fujifilm X-T1 with the XF 18-55mm shooting a timelapse of the moon rising and the eclipse in progress. The latter was mounted on a Joby Gorillapod mounted on the railing. 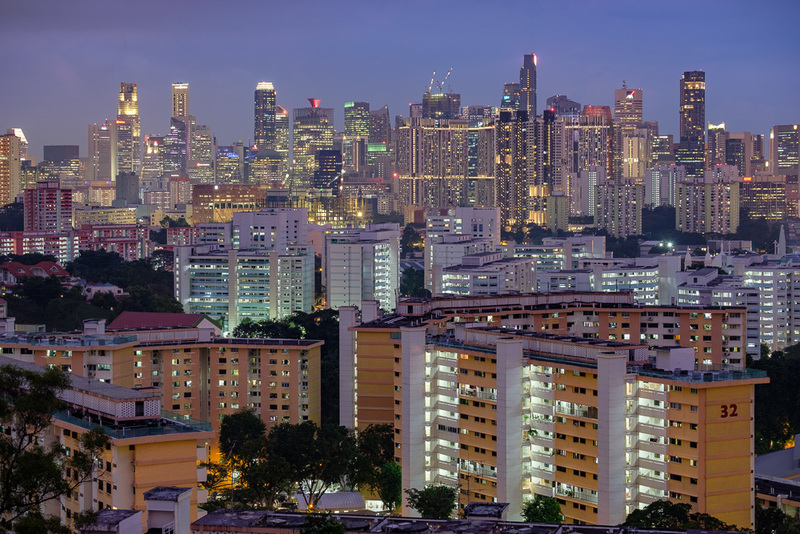 While waiting, I got a shot of the beautiful skyline and HDB flats at the blue hour. Then the wait begins. 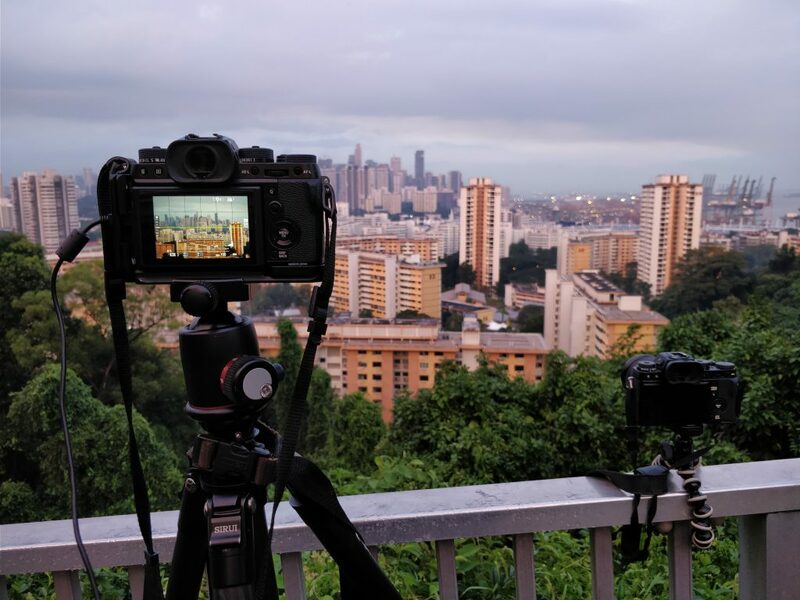 HDB Estates and Singapore Skyline seen from Mt. Faber. The Photopills app told me that the moon would rise approximately from behind the UOB tower, which will potentially make a good shot. Here is a mockup of what I had hoped to capture. 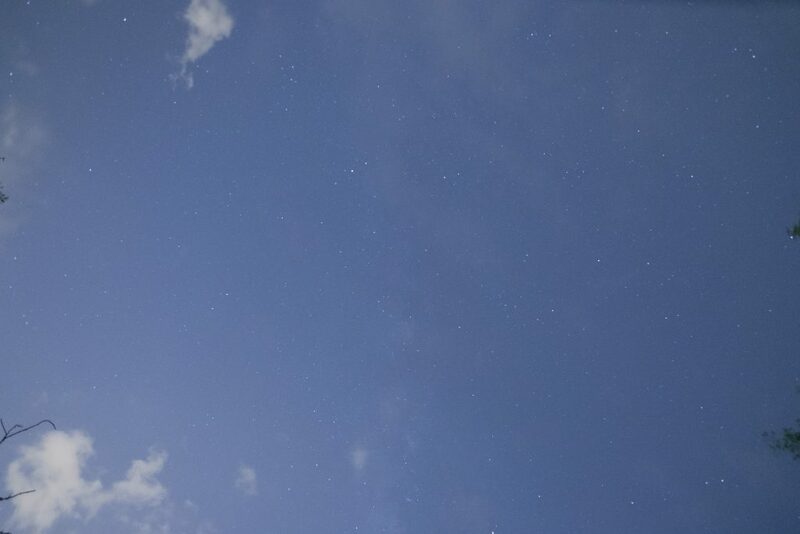 Unfortunately, due to low cloud cover, I didn’t see the moon until it’s too high up in the sky. This made any form of juxtaposition impossible. I decided to just shoot the moon at full zoom as the eclipse progresses. The X-T1 is still happily shooting a frame every minute. The moon finally made an appearance, albeit at too high and altitude. As we approach the time of totality, many more people has gathered around the location to watch and shoot the event, mainly on their mobile phones. The moon has turned red at about 8:50pm, and turning a blood red as it approaches totality at 9:29pm. Back home, I composited the shots from the X-T1 into a single frame. I chose every 4th frame as it gives the best spacing between the moon shots, and also extended the top of the photo so that I can fit more moons. The result is the photo opening this blog post. I also selected a few key frames from the X-T2 to combine into a single frame to show a larger photo of the moon as it progresses into the eclipse. These are spaced roughly 30 minutes apart. 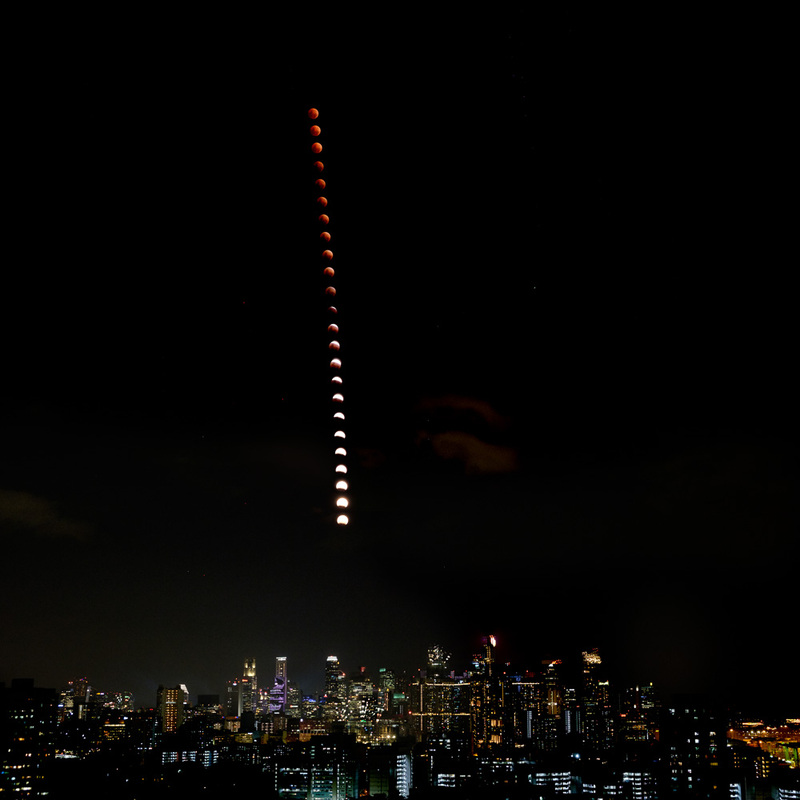 The next occurrence of this trifecta will be on 31 Dec 2028, while a regular lunar eclipse will occur on 28 July 2018. 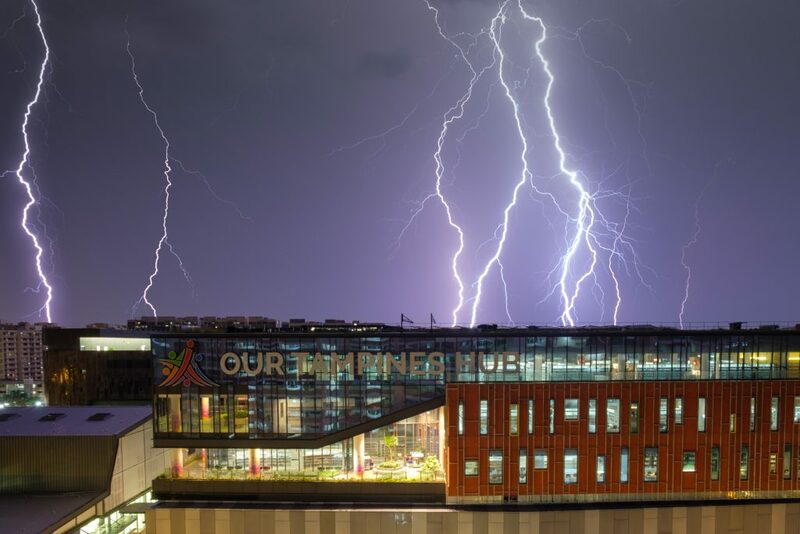 According to the National Environmental Agency (NEA), Singapore has the world’s highest occurrence of lightning activity in the world. As we approach the monsoon season, we experience more thunderstorms throughout the day and night. Yesterday is one such night where there’s large storm, accompanied with a intense lightshow of lightning bolts. After the rain has subsided enough to let me open my windows without it splashing into my room, I setup my tripod with the Fujifilm X-T2 to take 15s exposures continuously. I have done this twice in the previous years, and looking back, I found that it has also captured the changes to the landscape that’s in front of my window. 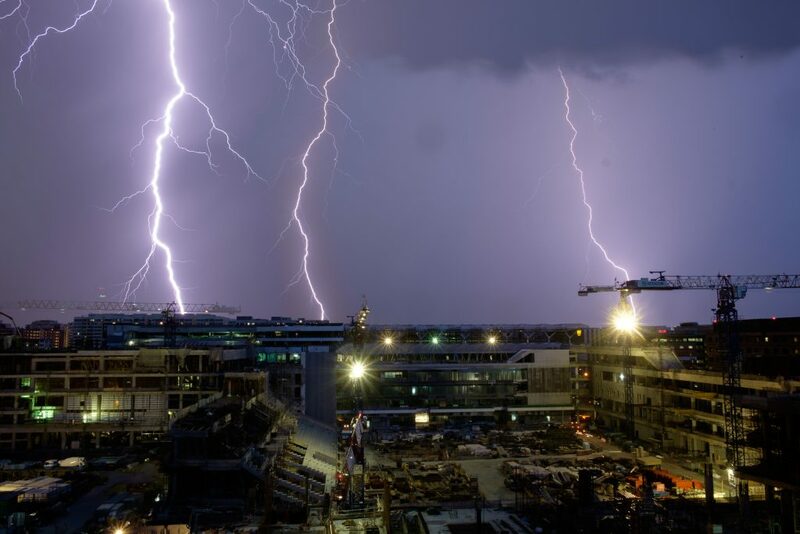 In 2013, when I first caught lightning on my camera, Tampines Stadium still stands. 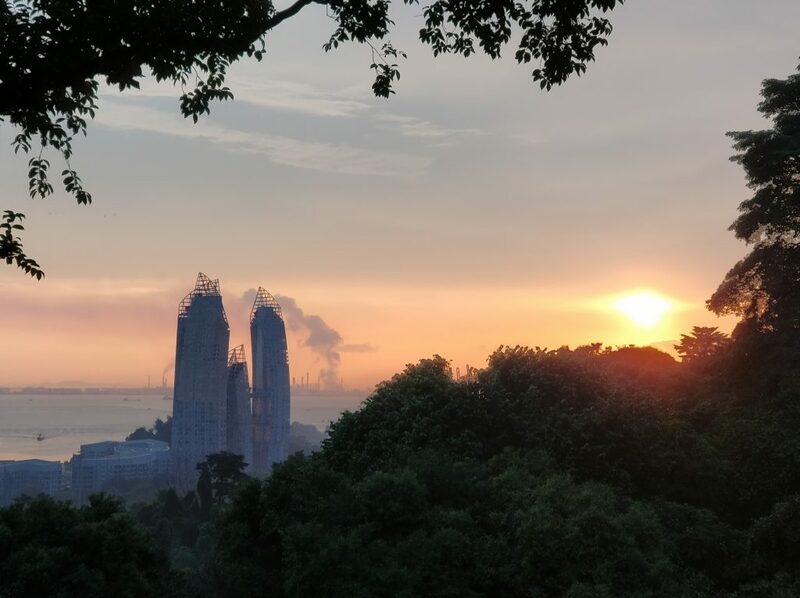 When I caught it again in 2016, it has been demolished and the construction of the new Tampines Hub is in progress. And yesterday, Our Tampines Hub now stand tall in front of my block. Three different thunderstorms, three different years, three different views. 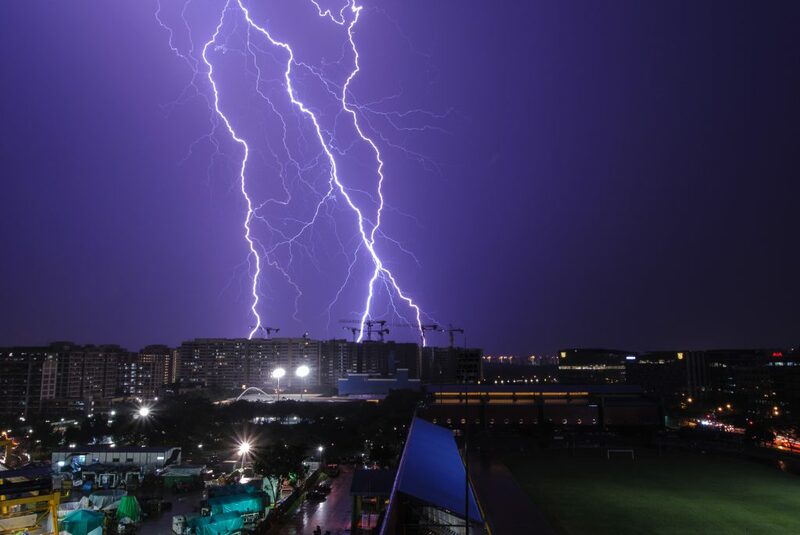 Lightning storm over Tampines Stadium on 13 Apr 2013. Although I had the opportunity and luck to have seen and shot the Aurora Borealis, I have never seen (much less shot) the milky way. Singapore is just too light polluted and cloudy to ever see it, so the only way is to get out of here. 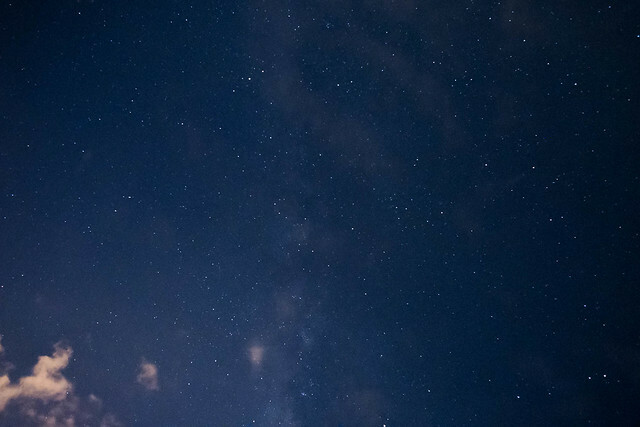 So, when a friend asked if I want to join her on a weekend trip to go over to the Sky Mirror in Kuala Selangor, Malaysia to try our luck at photographing the Milky Way, I jumped at the chance. 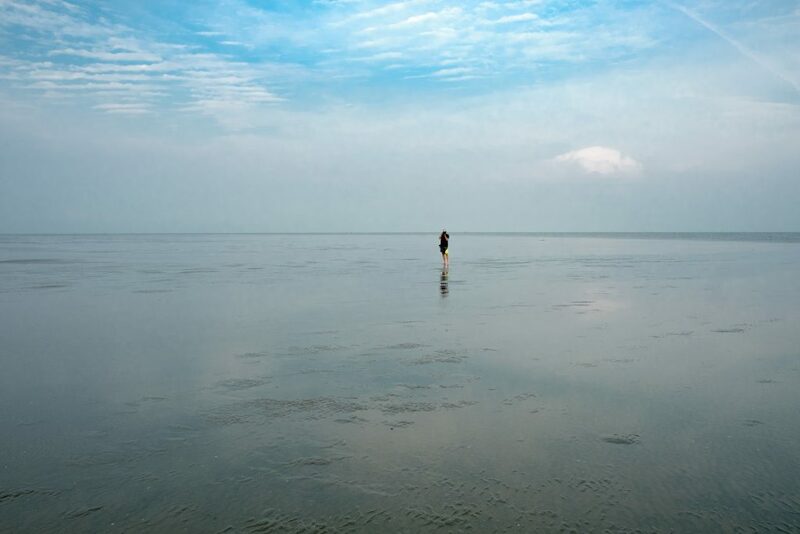 Sky Mirror is this offshore island roughly 45 minutes from Kuala Selangor that emerges only for a few days in a month during low tide. During these times, the shallow water reflects the sky (and other objects on it), hence the name. It’s dubbed the Salar de Uyuni of Malaysia, after the salt flat in Bolivia. As the tour operator normally does not operate at night, we had to charter the entire boat for our trip. The very friendly Dyven Wong, one of the owners of the Sky Mirror Tour, brought us around. The Sky Mirror in the morning. It’s still cloudy on this day, with only a bit of the blue sky showing. Being offshore, it’s far away from light pollution, but unfortunately on the night that we were there, almost the entire sky is covered with clouds. We stayed for a long time, but the clouds never cleared enough to reveal the elusive Milky Way. 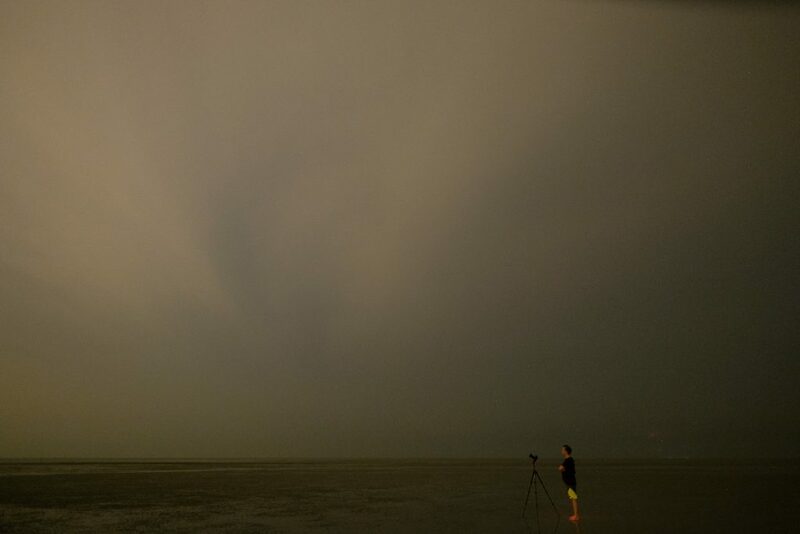 We had another night, so we decided to scout for a few potential locations around Kuala Selangor and Sekinchan, but the skies remained largely cloudy. Finally, after dinner, we found a location that had lesser clouds but we were unable to spot anything while we were there. Back home, I decided to see if I could pull out anything from my RAW files. Here is what it looks like before any post-processing. First order of the day is to correct the white balance and tint to remove that awful colour cast. White Balance and tint adjusted. From then on, I tweaked the contrast, black & white points, exposure to try to bring out the Milky Way. The Dehaze tool in Lightroom also helped a bit. Finally, noise reduction was applied and the distracting branches were cropped out. The result is the opening shot at the top of this post. Not fantastic, but hey, there’s always a first time right? 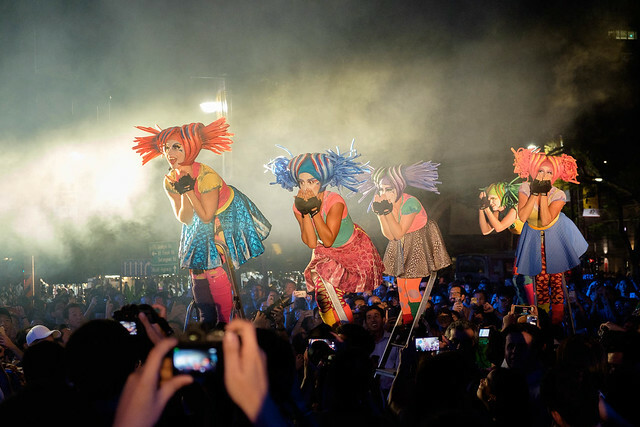 The tenth edition of the popular Singapore Night Festival ended on 26 Aug 2017, with the highlight show being The Globe by Close Act Theatre. 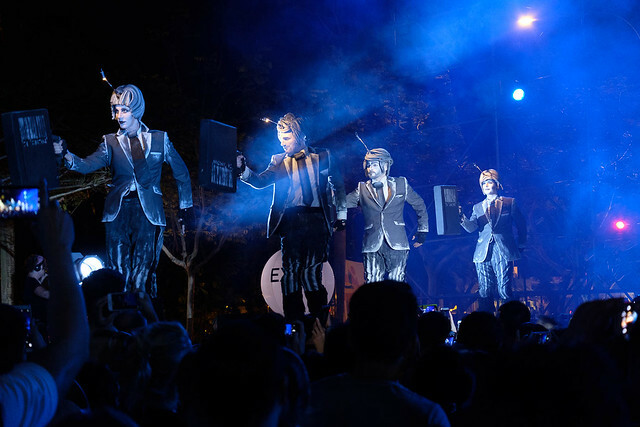 The Dutch theatre group has also performed at the 2016 Night Festival, wowing audiences with their two performance titled Let’s Celebrate, and Invasion, the latter of which featured dinosaurs and other prehistoric creatures. 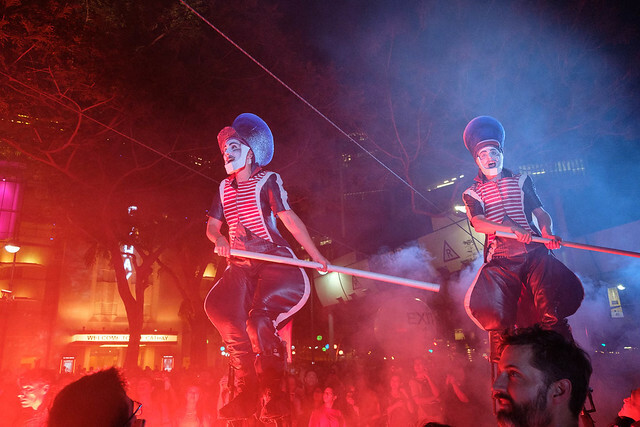 The Globe is performed at Cathay Green, right in front of the Cathay Theatre near the end of Orchard Road. 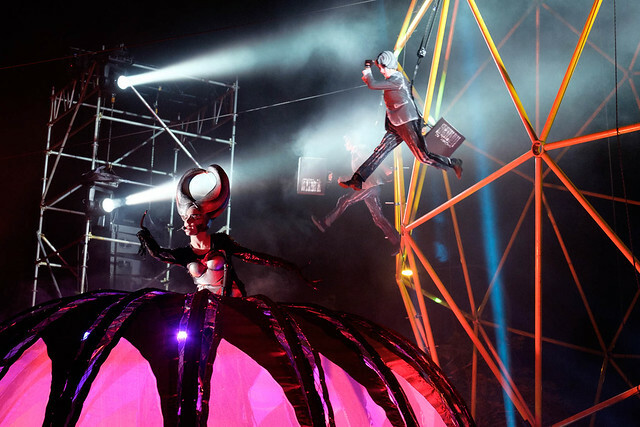 It centres around a hollow globe (hence the name) and features performers on stilts who rove around the audience. It visualises the art of liberty and proves flying as supreme happiness.The spectacle shows the childlike imagination as instrument to enables one to fly. As I had anticipated shooting both wide and tele and didn’t want to waste time switching lenses, I brought along both my Fujifilm X-T1 and X-T2 cameras. One has a XC 50-230mm f/4.5-6.7 while the other had the XF 18-55mm f/2.8-4 kit zoom. I shot both cameras at ISO 3200, and despite being a rather “slow” lens, the 50-230mm performed surprisingly well as the performance is very well lit. I shan’t bore you with more words, so here are some more photos from the performance. 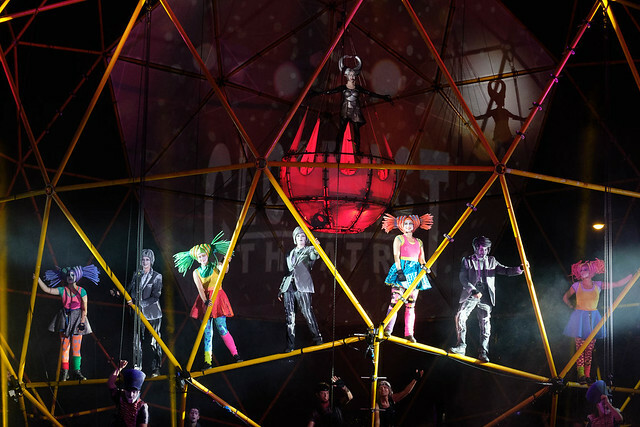 The villainess in front of the globe, with other performers on the globe appearing to give her a good kick. 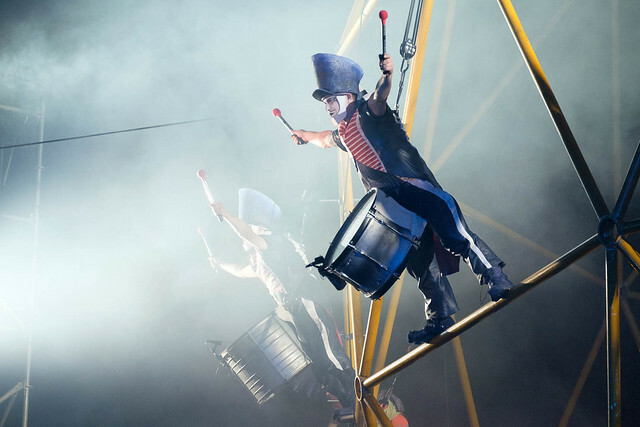 Drummers hanging off the globe. The kid character is happy that the villainess is gone. (Some of) the cast of The Globe by Close Act Theatre. 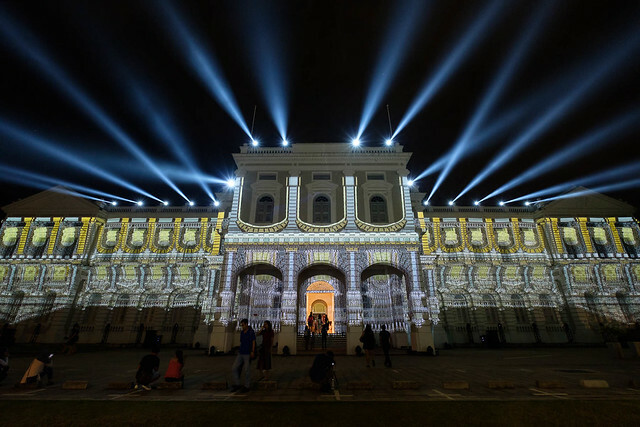 Ever since I started shooting the Night Festival 5 years ago, digital mapping projection is a mainstay in all other editions. The tenth edition is no exception, featuring a projection piece by EZ3kiel from France, set to an earworm-inducing sound track. 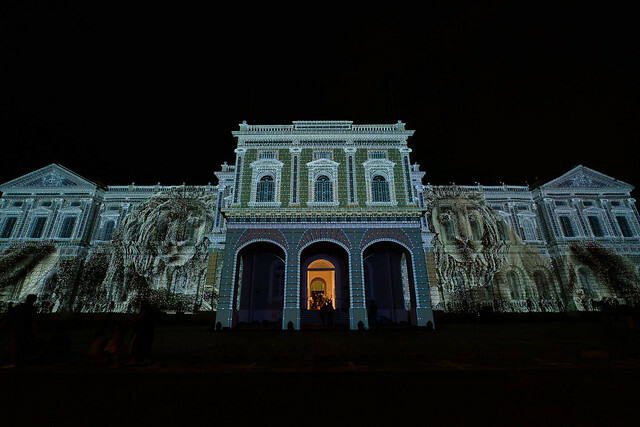 The piece was projected onto the façade of the National Museum of Singapore. 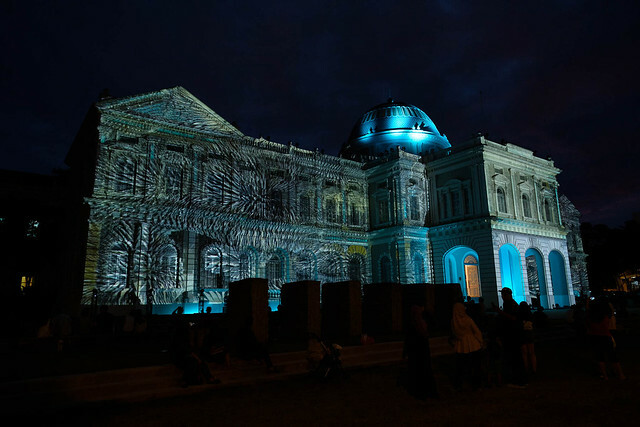 Convolutions by EZ3Kiel (France) This is the first time I saw the dome of the National Museum being lit up. The front of the museum is really wide, I can hardly capture it with my XF 10-24mm lens which is equivalent to 15mm in full frame. 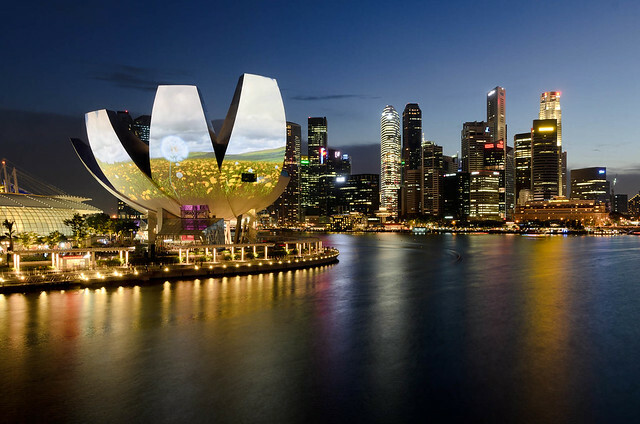 Local photographer Darren Soh managed to capture the entire façade using a 10mm full-frame lens, though. 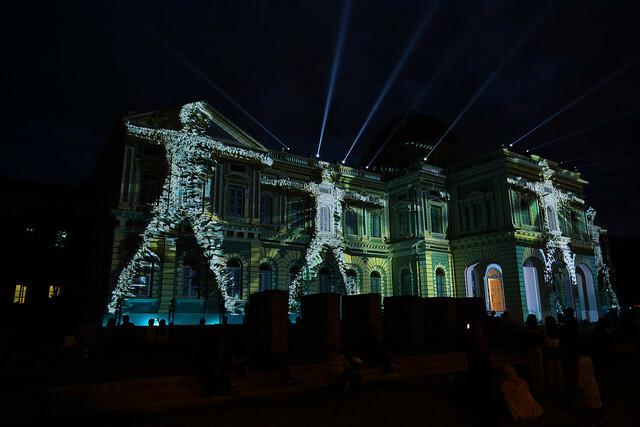 Another view of the standing men scene, from the front of the National Museum. I also recorded a video of the entire thing, splicing together 2 different angles. Unfortunately, I did not bring along a tripod so it’s kind of shaky. This is also the first time I tried out “multi-cam” video. 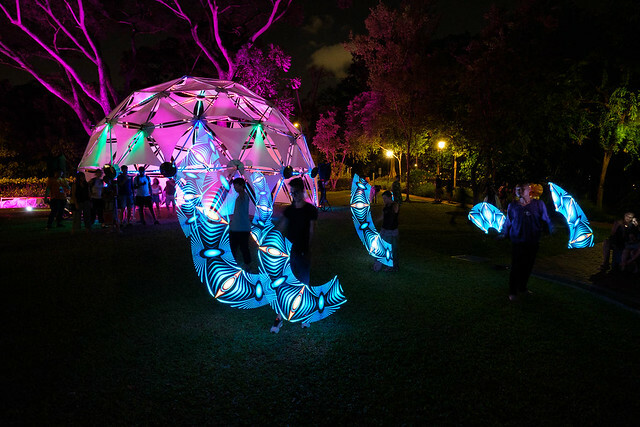 Over at the National Design Centre is an installation named Phosphene, by Praxis+. Like last year, there is a long queue to view the installation. Mine took about 45 minutes. 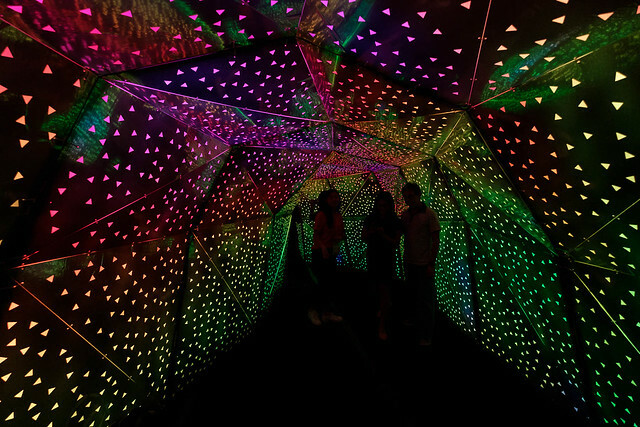 This is a tunnel of colourful LEDs which visitors can walk through. 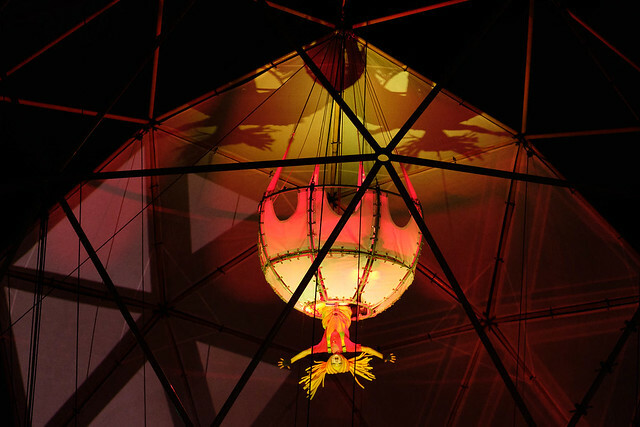 Local performance group made an appearance again in the Night Festival, this time with a bamboo dome with a tessellated fabric roof resembling the flower of life. 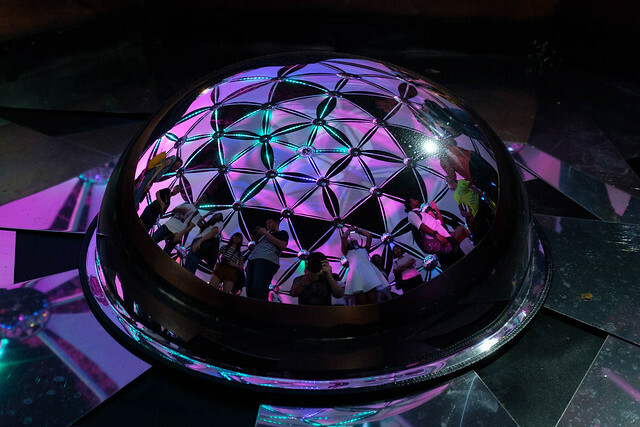 Inside the dome are several geometrically-arranged convex mirrors that form dynamic reflections of visitors as they walk through the dome. Starlight Alchemy performers playing with their LED rods in front of their installation. 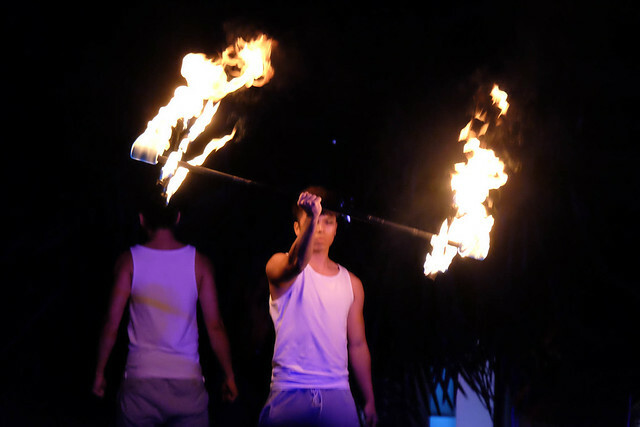 Starlight Alchemy is known for their fire and LED performances, and I am lucky enough to catch them practising with their LED rods when I visited. A convex dome inside the middle of the installation. 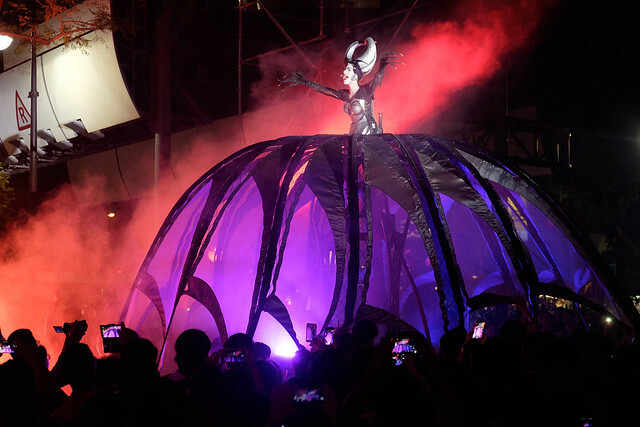 It’s been a blast attending the tenth edition of the Night Festival. Can’t wait for the next one! 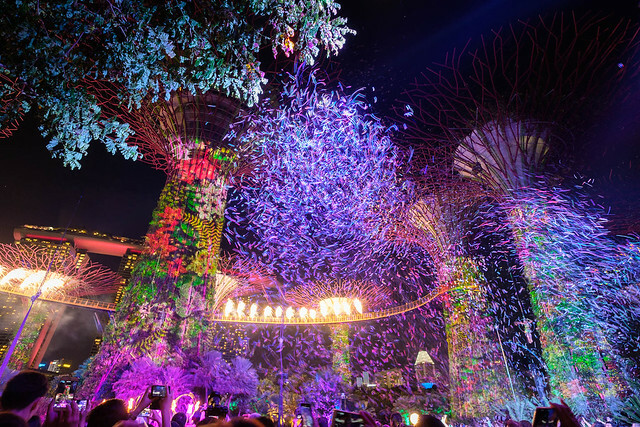 It didn’t seem that long that the Gardens by the Bay first opened, but time flies and it’s been five years! 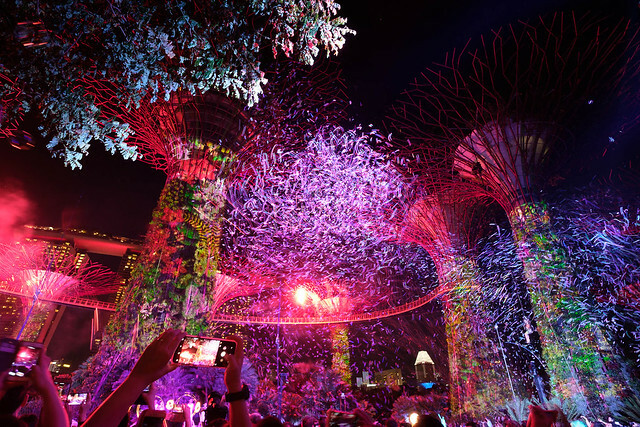 To celebrate their fifth anniversary, Gardens by the Bay organised a series of events, and one of them is the Gardens Extravaganza Special. 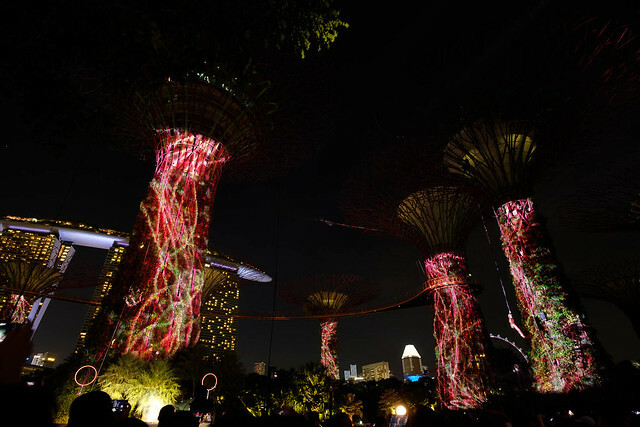 The multimedia show combining 3D projection mapping, fire/pyrotechnics, acrobats and trapezes took place at the Supertree Grove at the Gardens by the Bay over the weekend of 3-4 June 2017. After reading about this as well as seeing photos from the media preview, I made a trip down to watch and shoot the event. Expectedly, it was very crowded by the time I got there, but I managed to find an acceptable spot to shoot from, which gave me a reasonably good view of the Supertrees. 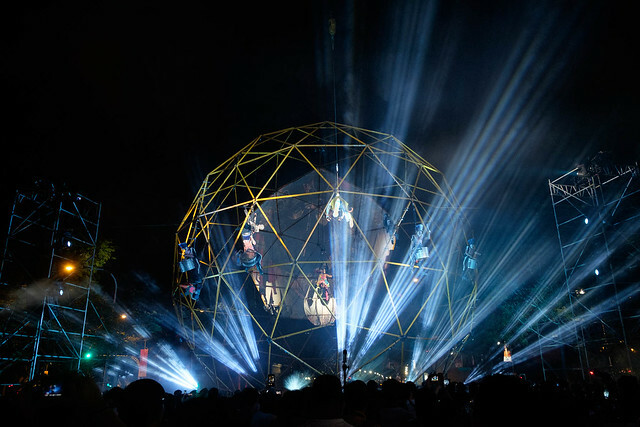 The show was done in partnership with local company, Hexogon Solution, which I remember also did one of the i Light video projections on the ArtScience Museum. 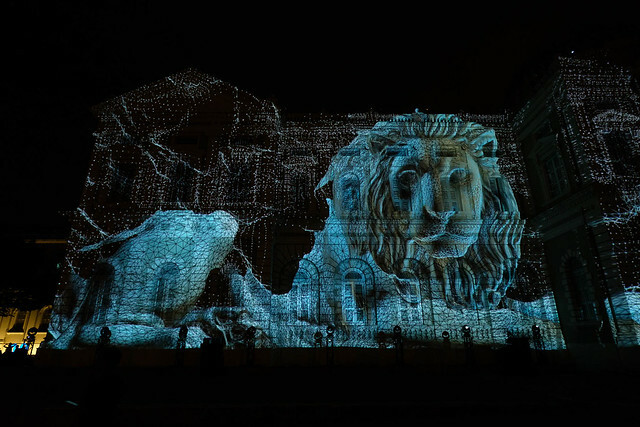 They have also done video mapping for National Day Parades and SEA Games. 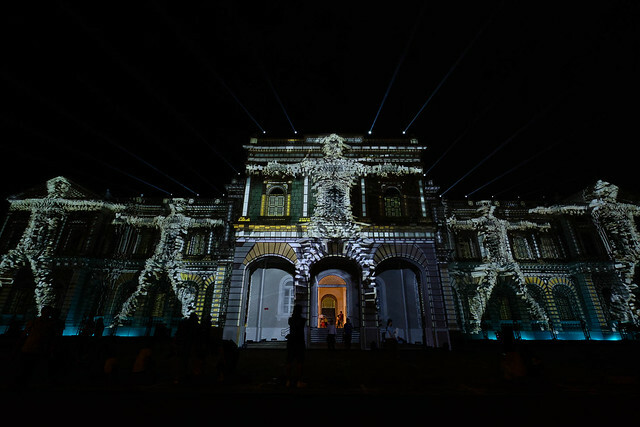 Thirty-two high-lumen projectors were used for this. 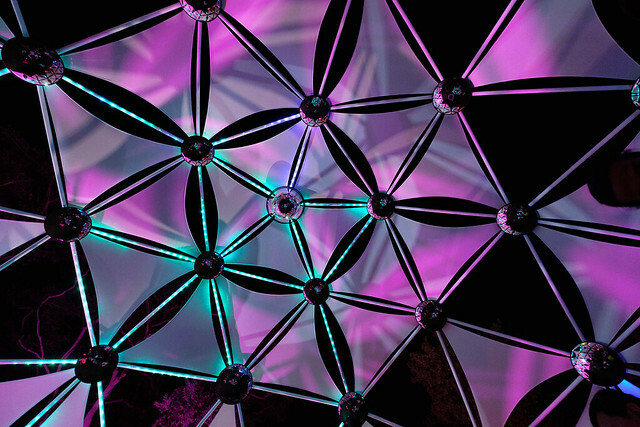 Garden of Light, an installation by Hexagon Solution for i Light 2012. 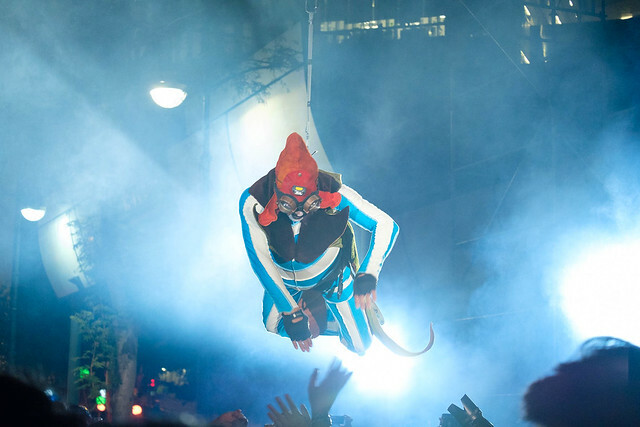 Here are some photos of the show. In order to capture the many things that were going on, I used both my Fujifilm X-T1 and X-T2, with the latter mounted on a tripod to capture the wide shots. 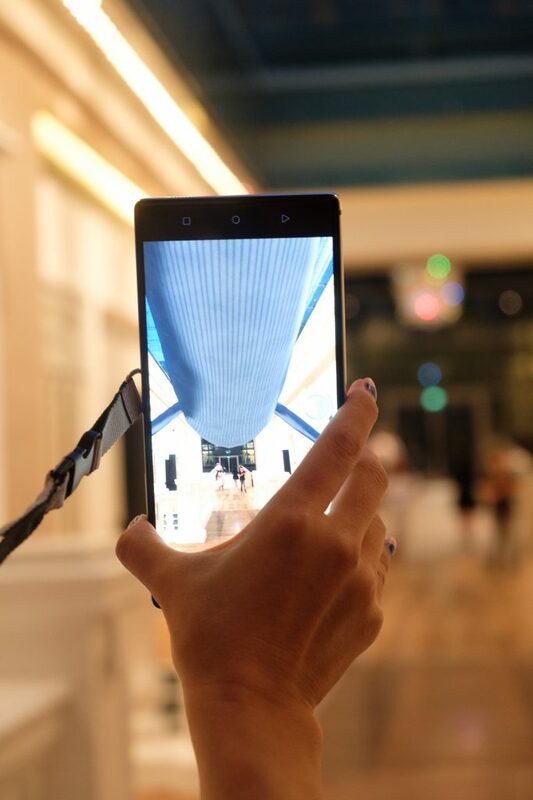 The lens used is a Zeiss Touit 12mm f/2.8. 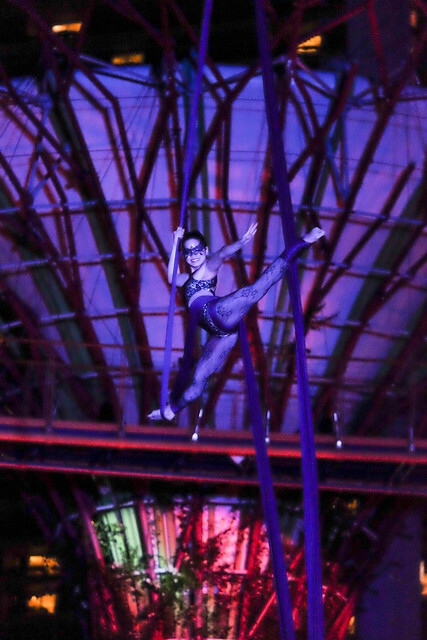 Performers were shot on the X-T1 hand held, using the XC 50-230mm f/4.5-6.7. 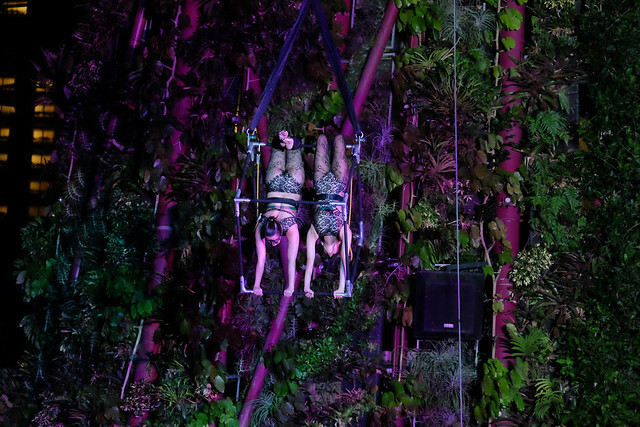 A pair of trapezes hang from a cube suspended from the Supertree. 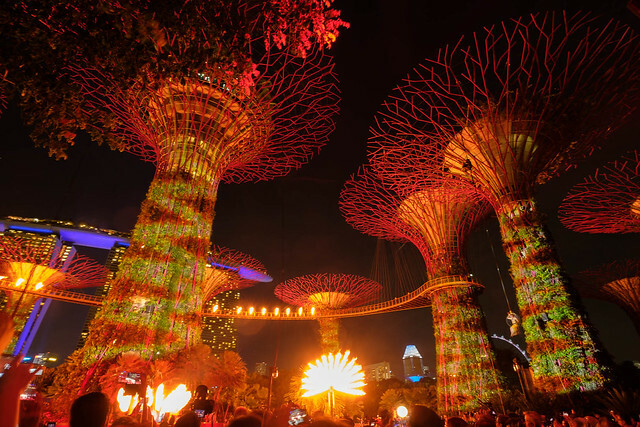 Bursts of fire emanate from the OCBC Skyway and around the Supertree Grove. 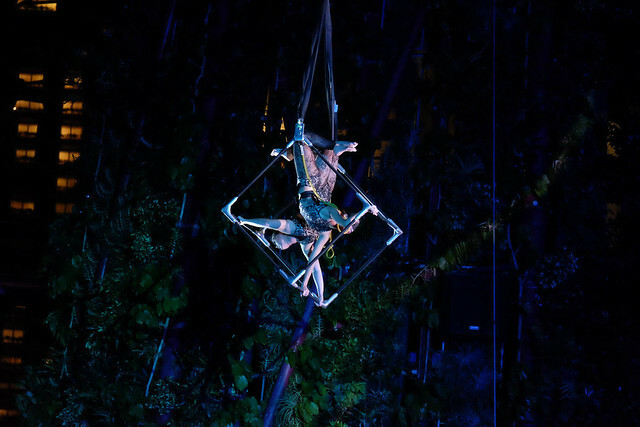 An aerial performer suspended from the Supertree. 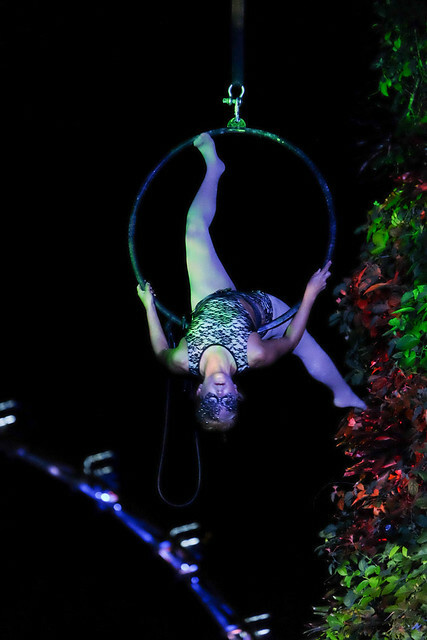 A aerial performer on a suspended ring beside one of the Supertrees. 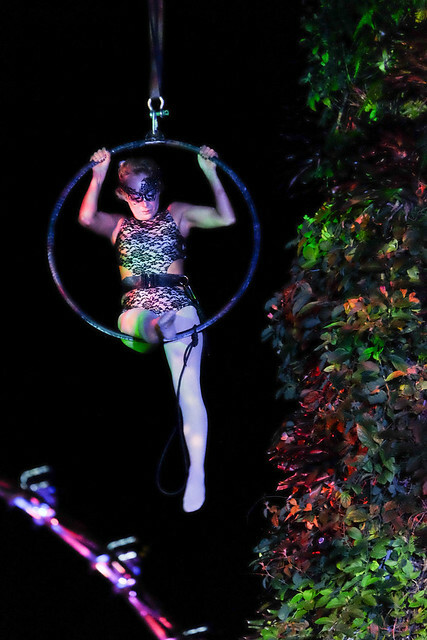 An aerial performer suspended on a ring from one of the Supertrees. In the background is the Singapore Flyer. Visitors take photos of the finale of the Gardens Extravaganza Special. The slightly long has caused the moving bubbles to form coloured streaks of light. I have also managed to borrow a GoPro Hero 5 Black to record the whole performance in 4K. You can watch it below. Be sure to watch in full screen 4K! By the time you read this, the special edition of the show is over. However, you can still catch a shorter (~9 min) version of it from now till the end of June 2017. Show times are at 7:45pm and 8:45pm. 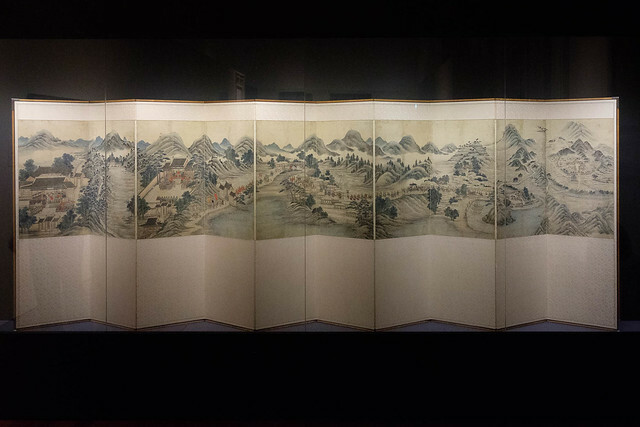 The Sun, Moon and Five Peaks on a 6-fold royal screen at the Joseon Korea—Court Treasures and City Life exhibition at the ACM. 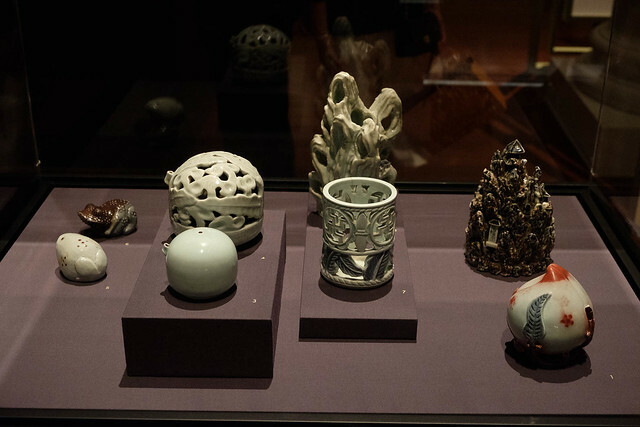 The sun and moon represent the forces of ying and yang, while the five peaks represent the five elements. 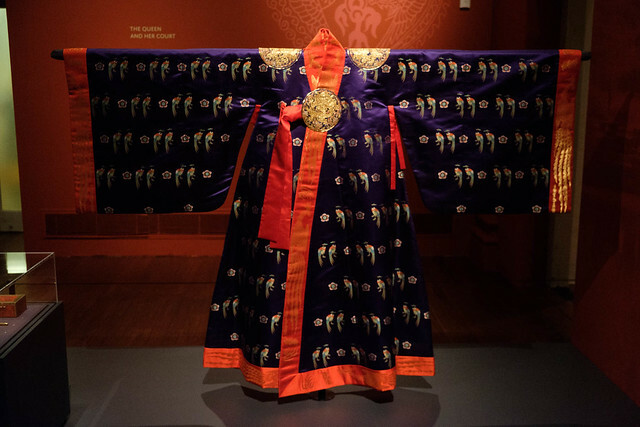 The Asian Civilisations Museum (ACM) has just launched a new exhibition titled Joseon Korea—Court Treasures and City Life. 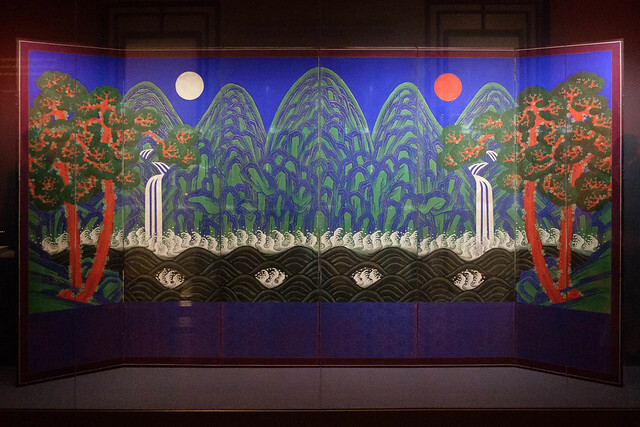 The exhibition is an intimate inspection of 500 years of the Joseon (1392 –1897) period which inimitably shaped modern Korea. 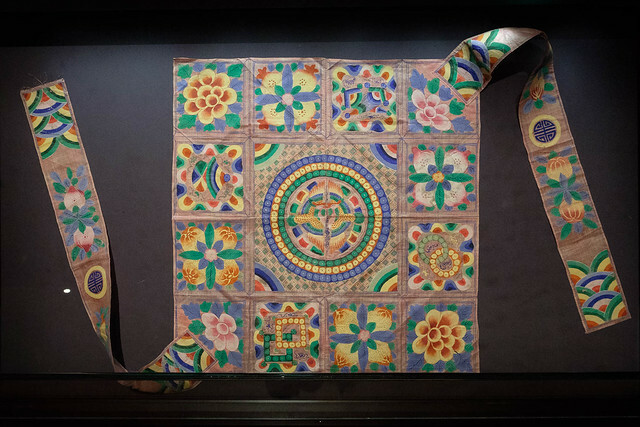 It features more than 150 artefacts and treasures from the National Museum of Korea and the National Palace Museum of Korea that depict various facets of the vibrant Joseon era, and took three years to prepare. 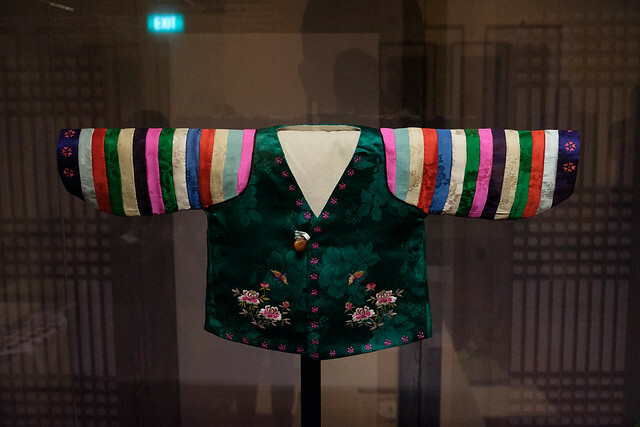 Fans of K-culture will find the showcase familiar, as many of the exhibits shown have inspired Korea’s pop culture from period drama series to contemporary arts and aesthetics. 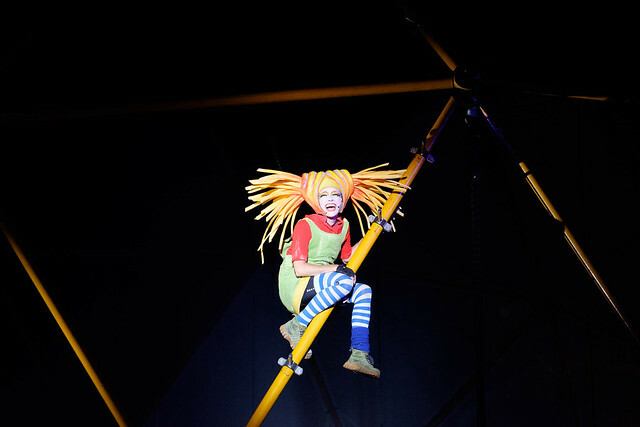 The opening ceremony started with a performance of “Story of the Rabbit”, a highlight scene from Sungungga, one of the five surviving stories of the Korean pansori storytelling tradition. It’s accompanied by musicians playing on traditional Korean musical instruments. 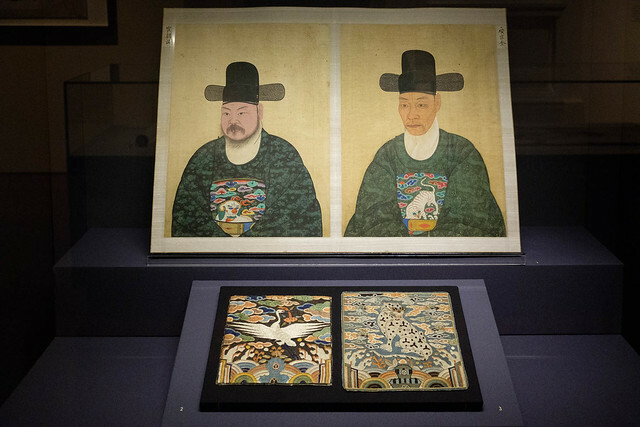 The exhibition was officially declared open by the Minister for Culture, Community and Youth, Ms. Grace Fu, and Dr. Yi Young-Hoon, Director-General of the National Museum of Korea. 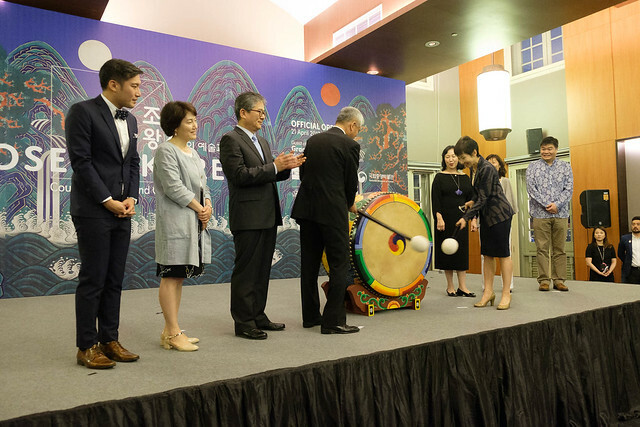 Minister Grace Fu and Dr. Yi striking a Korean drum three times for the opening. 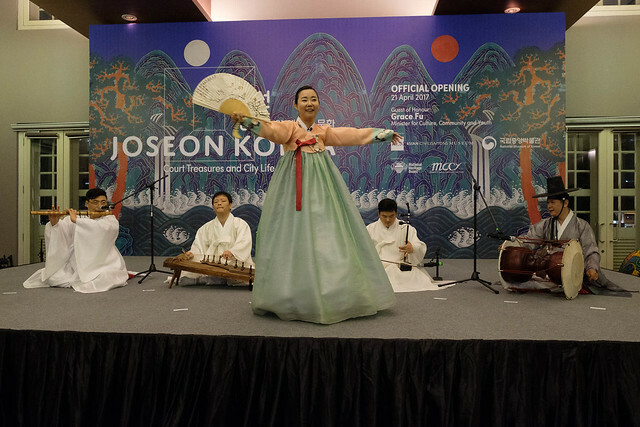 We were also treated to several traditional Korean dance / music performances before viewing the exhibition. 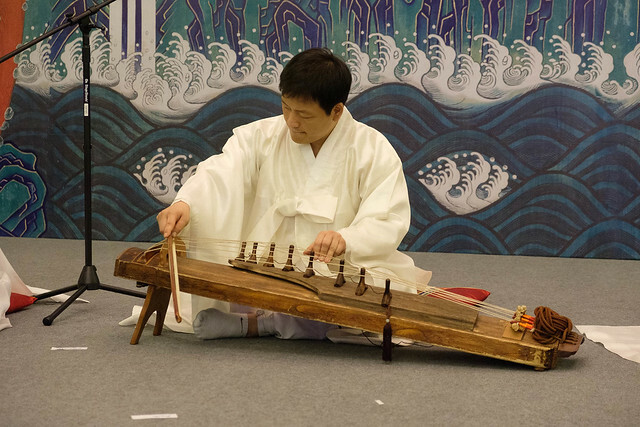 Interesting traditional Korean instrument. Don’t know what it’s called, it looks like a Guzheng but played with a bow. 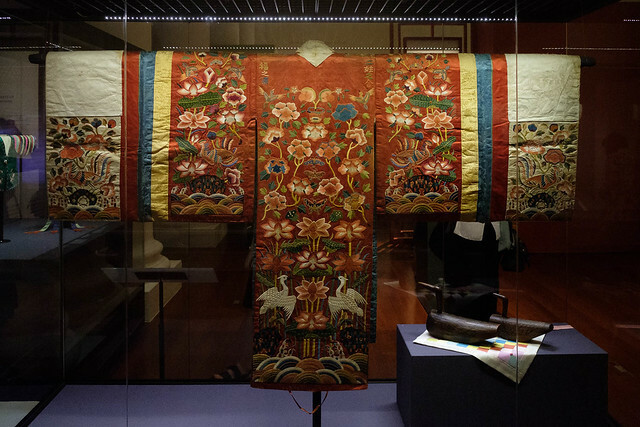 Here are a few of the exhibits on display at the Joseon Korea—Court Treasures and City Life, which will run from 22 Apr to 23 July 2017 at the Asian Civilisations Museum. 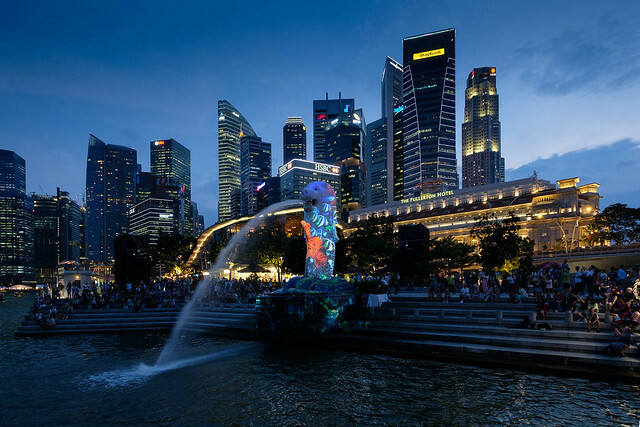 Tickets costs $10 for Singaporeans and PRs and $15 for tourists. 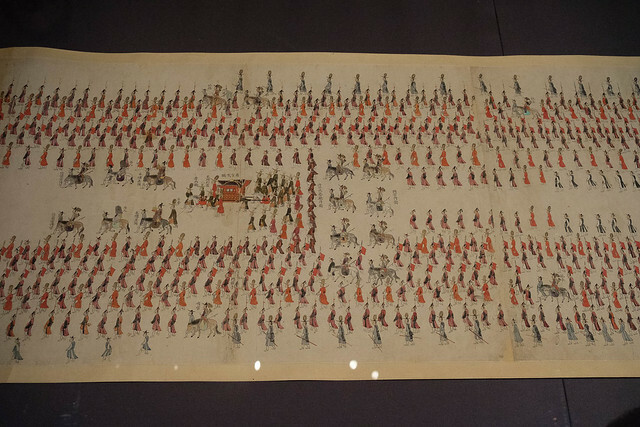 A section of a hand scroll depicting King Jeongjo’s Procession to His Father’s Tomb. 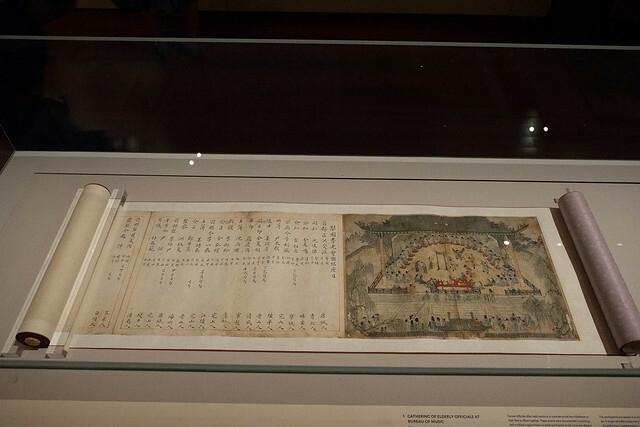 A painting showing the Magistrate of Dongnae (present-day Busan) welcoming Japanese envoys at Waegwan, the compound where Japanese envoys and trade workers were restricted after the Imjin War (1592-98). Used to prepare ink for writing or painting, water droppers were standard equipment on desks in a scholar’s studio. 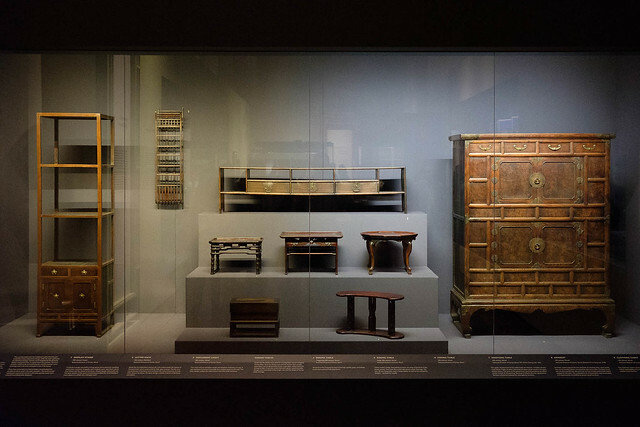 Much attention was paid to their aesthetic qualities, and they were made in a wide variety of designs. 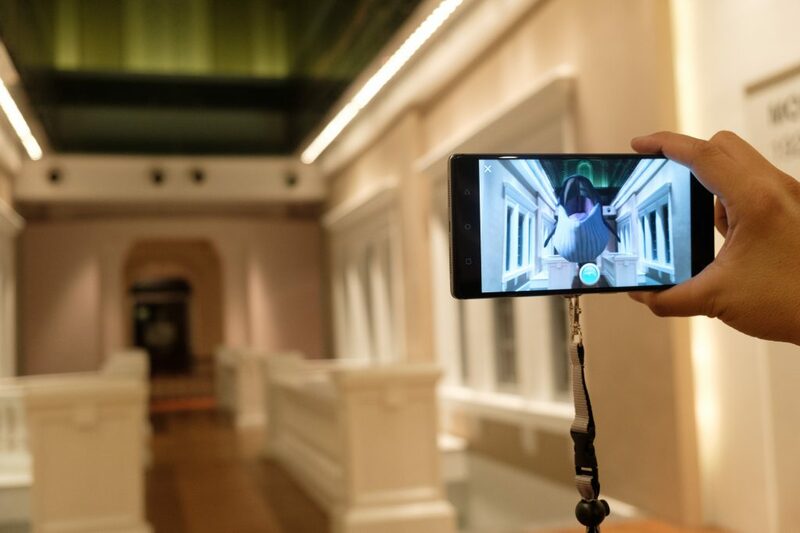 Starting from April 22, visitors to the National Museum of Singapore who are taking their architectural tours will have their experience enhanced with Google’s Tango technology. 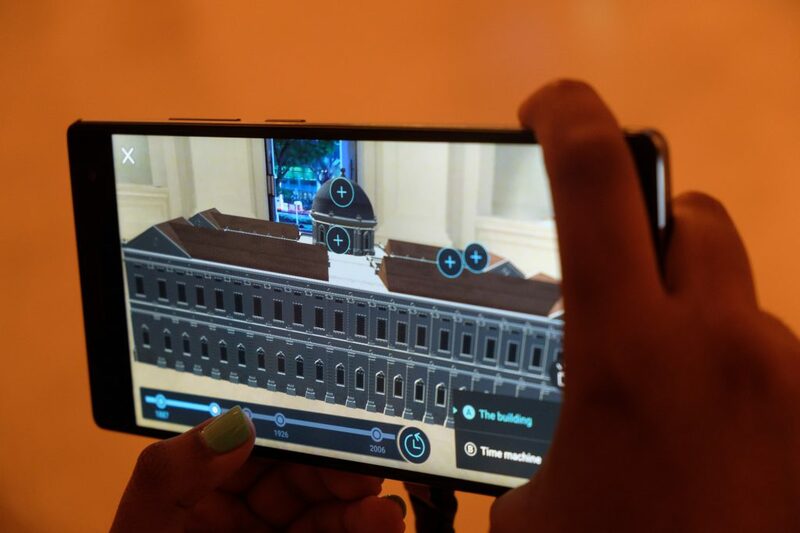 Visitors to this Tango-enabled Architectural Tour will be given a Tango-enabled phablet to use at six key locations within the museum. 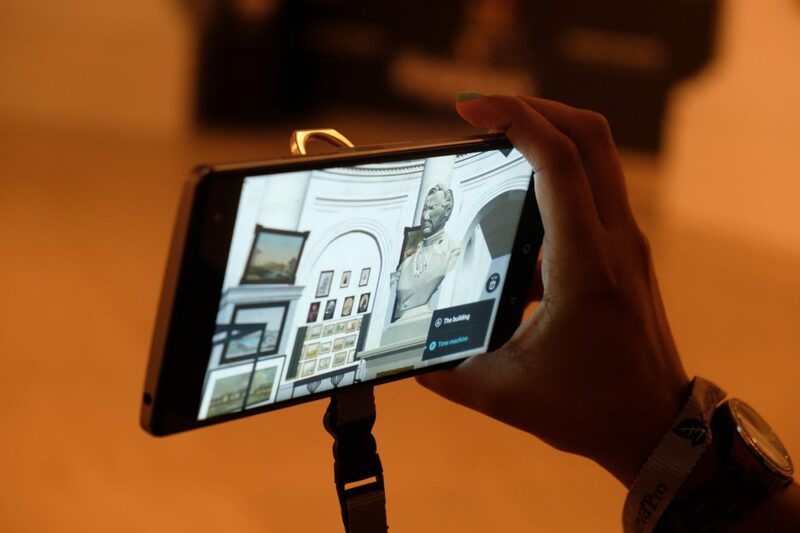 Using augmented reality (AR), computer vision and indoor location mapping, Tango transports the visitor back into the early days of the National Museum. 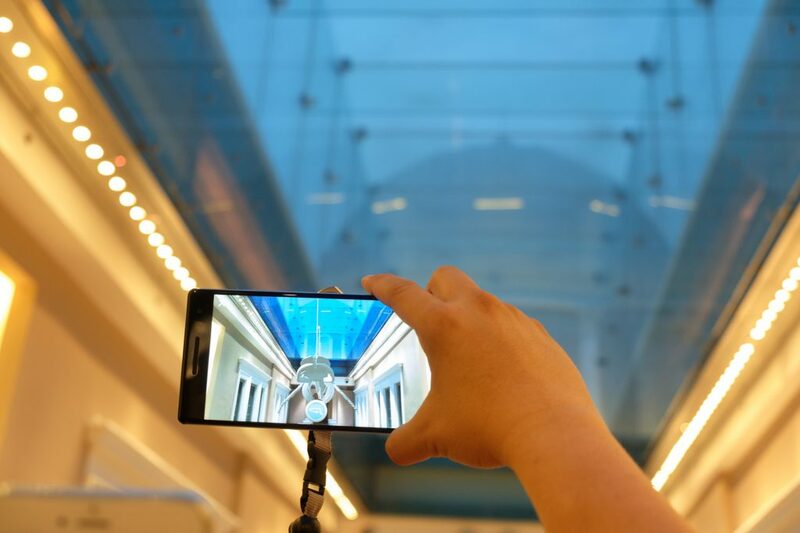 Under the museum’s rotunda, users can see the marble bust of Sir Stamford Raffles, as well as the clay tiles on the floor. 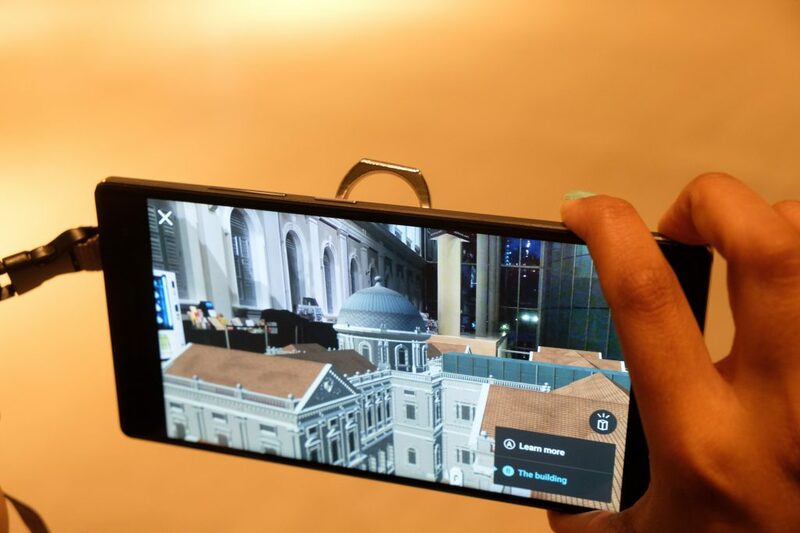 Over at the back, visitors can see a 3D model of the entire museum on the phablet from different angles by walking around it. 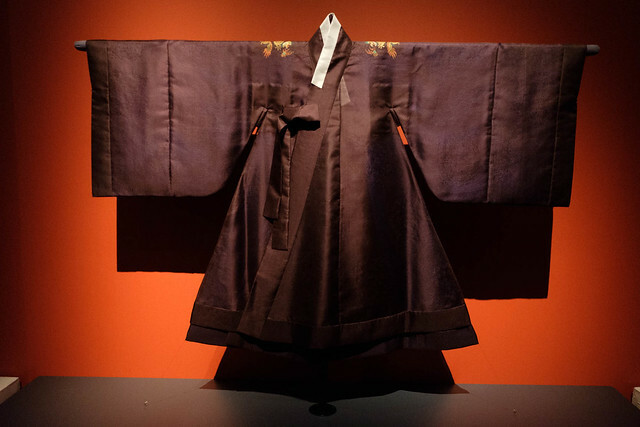 Activating the Time Slider view will allow visitors to select the different milestone years and see how the museum has evolved over time, including the construction of the new wing in 2006. The highlight of the tour is the virtual re-creation of the Finn Whale skeleton under the Glass Passage on level 2. 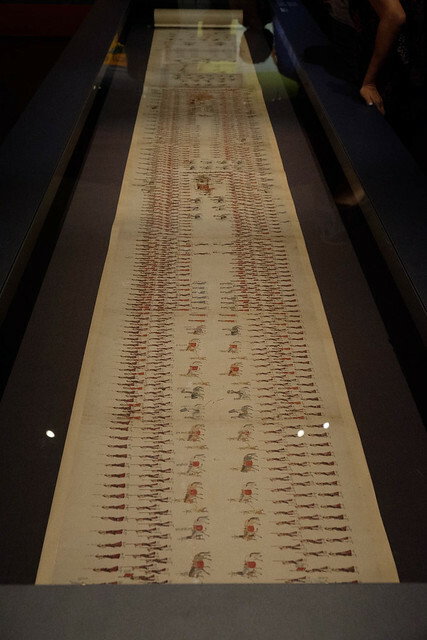 The 42-feet long skeleton occupied that space between 1907 and the 1970s before being returned to Malaysia. 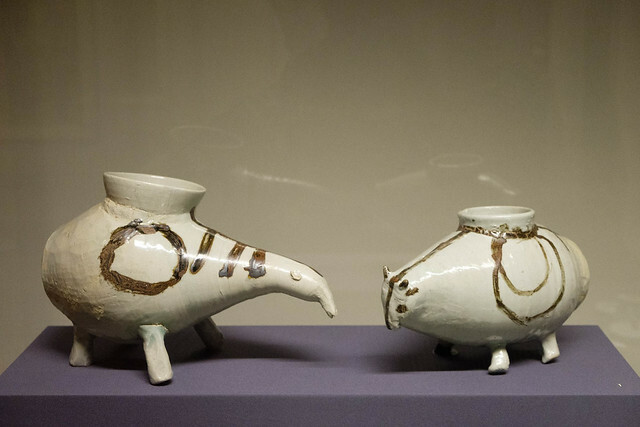 With the tap of a button, visitors can also see the whale with its skin, see it move, and listen to the whale’s calls. 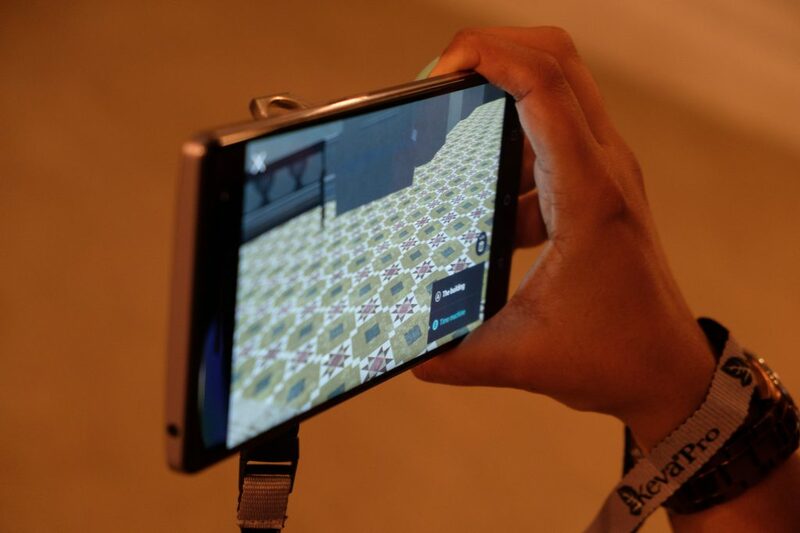 They can even take selfies with it! The Indian Finn Whale with skin on. The hour-long Tango-enabled Architectural Tour will begin from 22 Apr. Registration is free of charge and on a first-come, first-served basis. There is a minimum of 5 and maximum of 15 people per group. 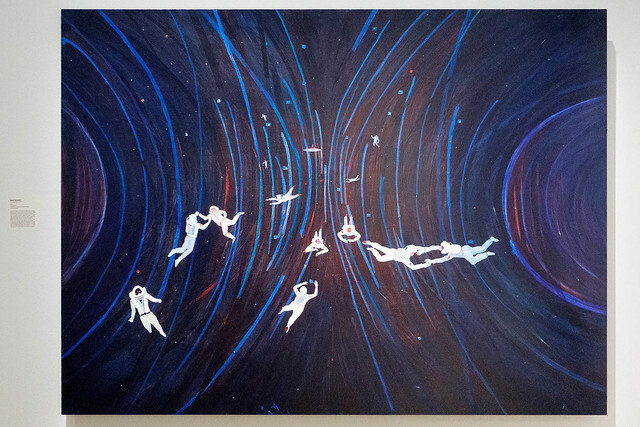 Space Investors by Jules de Balincourt (2015). This artwork is also used for the marketing visual for The Universe and Art exhibition at the ArtScience Museum. 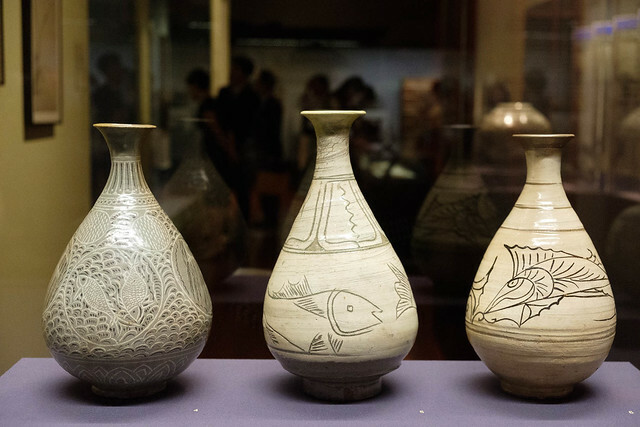 For centuries, humans have always been fascinated by the universal and what lies beyond. We even make use of celestial objects like the stars to help us find the way, or to attempt to predict the future. The Body of the Sea by Danny Rose (France) at twilight.